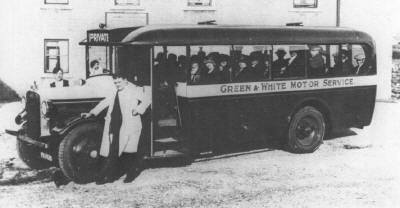 000000 General_Plummer_Charabanc_34_seats 1919 - ? 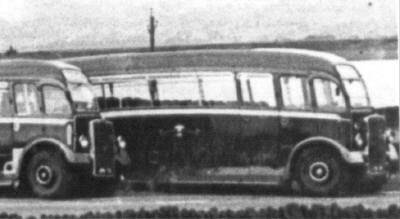 000000 Maid_Of_The_Mountains_Charabanc_ 1920 - ? XB8161________________________ 1920 Albion B14F seats 1925 - ? 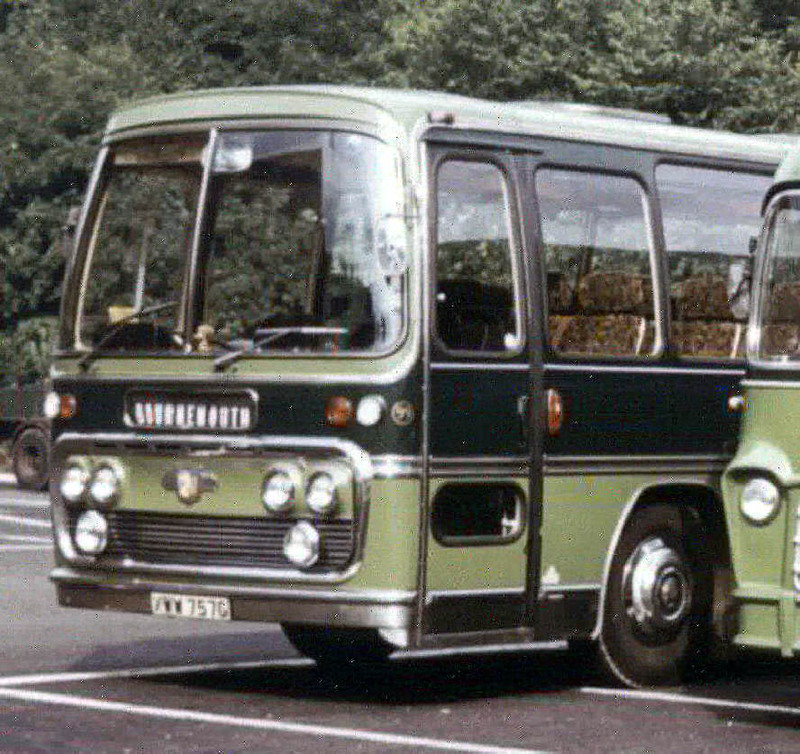 WA7462________________________ ? 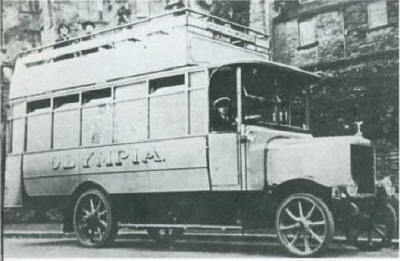 Leyland 14 seats 1928 - ? 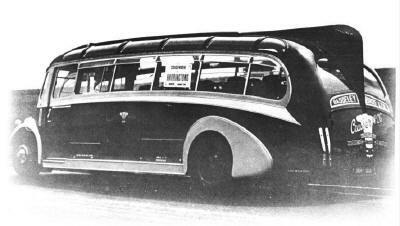 VM3223________________________ 1928 Dennis 1929 - ? 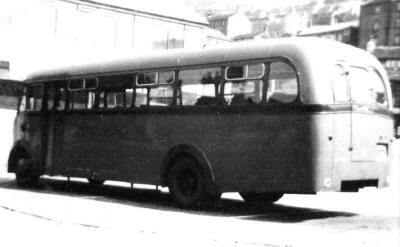 3_VR7509______________________ 1930 AJS C26F seats 1936 - ? 53_HL8065_ 1937 Leyland Tiger TS7 Brush B34F seats rebodied ?, 1953 - 1960 ex West Riding Auto Co.
Doors_converted_to driver operation for one man operation before entering service, suffered a brakedown on service towed to Albert Haighs scrapyard. 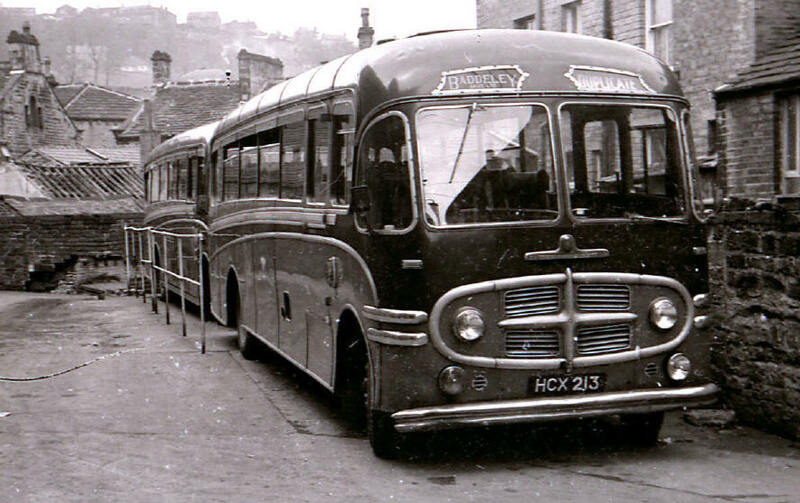 80_________ Ex Hanson 331, Ex S. Hughes Nov 1962, Ex Gregory Bradford May 1963. 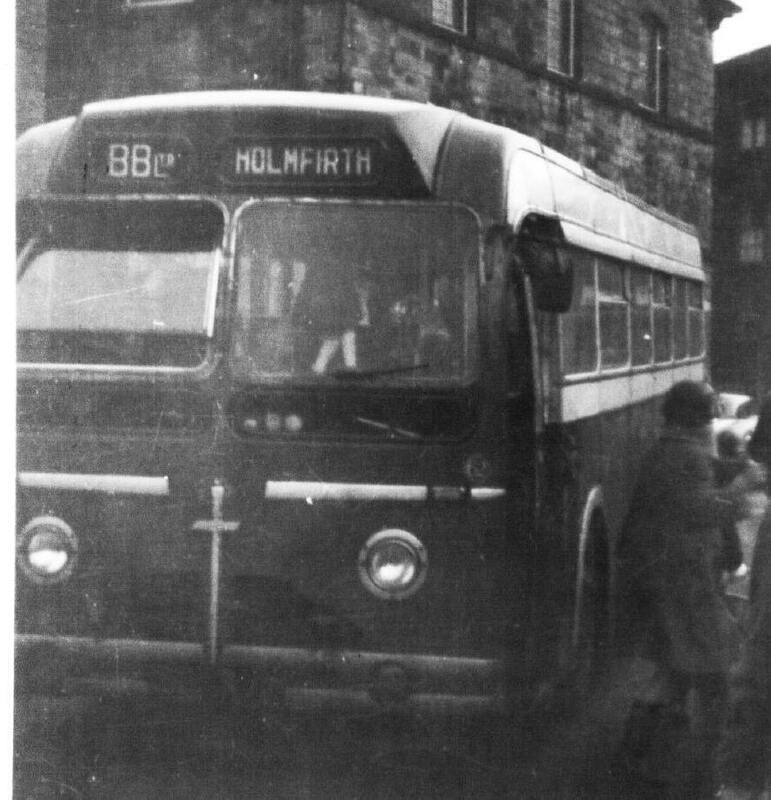 Ex_G.W._Castle,___ Holmfirth, Jun 1963, Passed with the G.W. 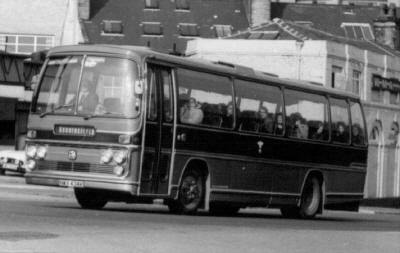 Castle coach business to Baddeley Bros in exchange for Baddeleys taxi business. 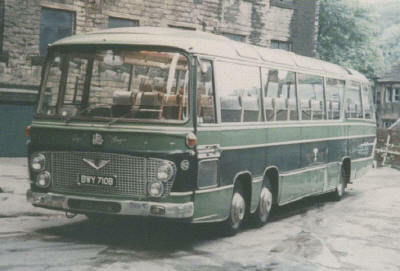 88_RJX256__ Albion Nimbus NS3AN Weymann B31F seats 1967 - 1971 one man bus (Deepcar) ex Halifax. 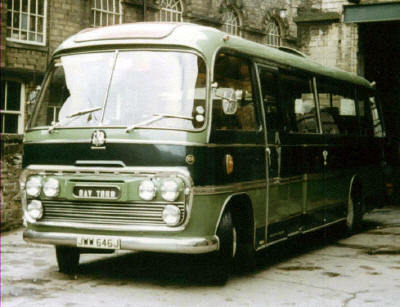 110_NWX434K Bedford YRQ Plaxton C45F seats 1972 - 2 Mar 1976 passed on to W.Y.P.T.E. 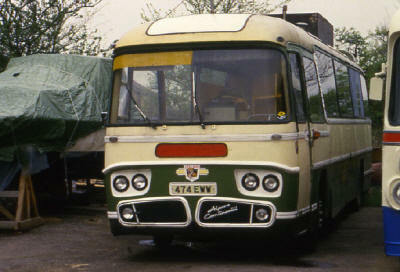 as 4110 2 Mar 1976 - 14 Jan 1980. 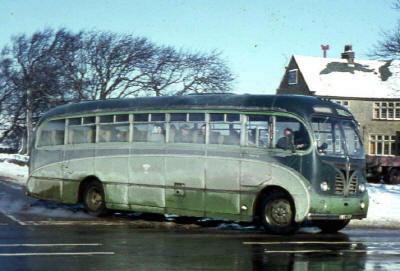 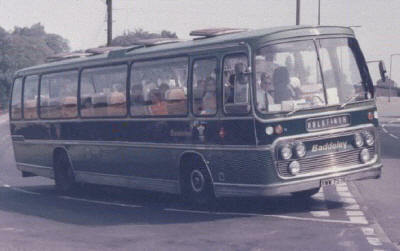 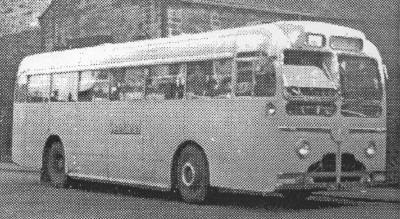 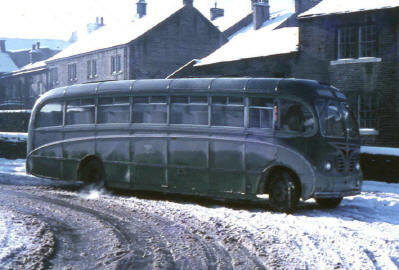 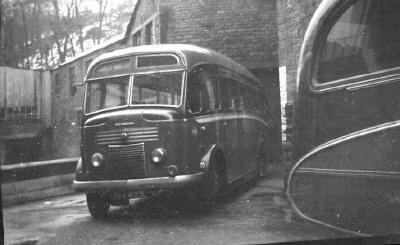 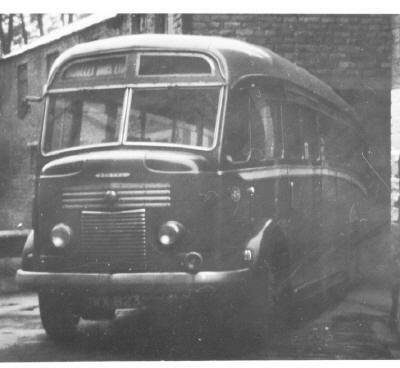 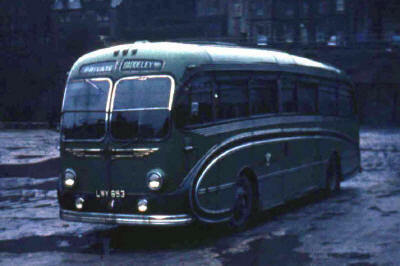 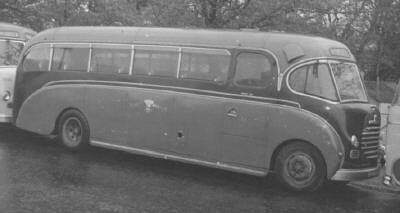 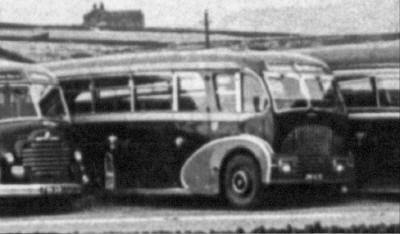 The Baddeley Bros., Jesse & Leonard Baddeley commenced operations from Fieldhouse Road, off Leeds Road, Huddersfield & ran charabanc's & buses in the Huddersfield & Brighouse area, Services were soon started in the Holme Valley with garages at Brockholes and Holmfirth, using the operating names of Olympia & Green and White. Baddeley Bros. Ltd. of Holmfirth, a 10,000 population West Riding town, on the Pennines. 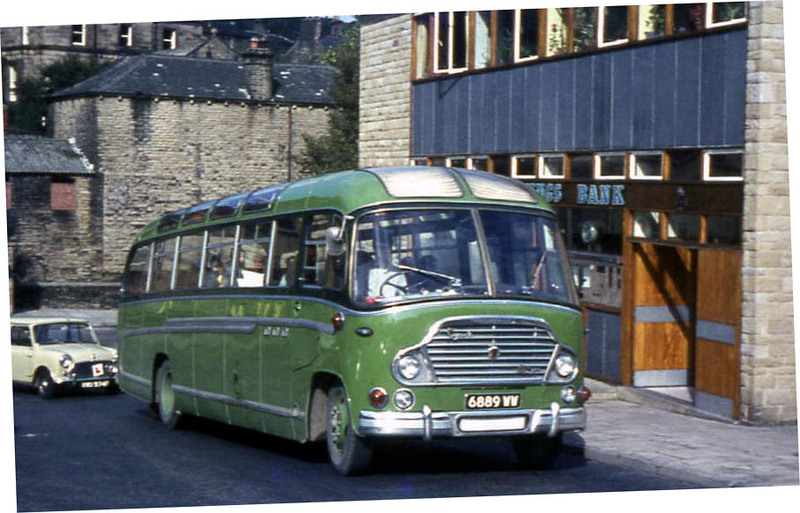 And what at first sight might seem “off centre” is from an operational viewpoint “dead centre” for Holmfirth, while the centre of one of the most sparsely populated areas of Great Britain, is equidistant from Leeds, Manchester and Sheffield, the big towns 22-25 miles away. The company itself was founded in 1925 at Leeds Road, Huddersfield, by the brothers, Jesse and Leonard Baddeley. 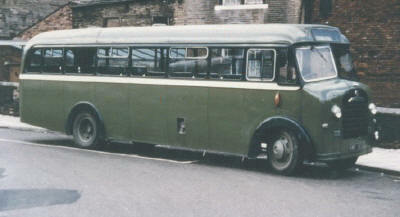 It transferred to Holmfirth in 1930, and the head office, travel office and garage were acquired in 1942. Before the 1930 Act stage carriage services were operated between:- Holmfirth-Jackson Bridge and Victoria; Holmfirth to Penistone via Dunford Bridge; Holmfirth to Penistone via Flouch Inn; Holmfirth to Sheffield via Flouch Inn; Huddersfield to Sheffield via New Mill and Flouch; Huddersfield to Scholes and Holmfirth to Huddersfield. 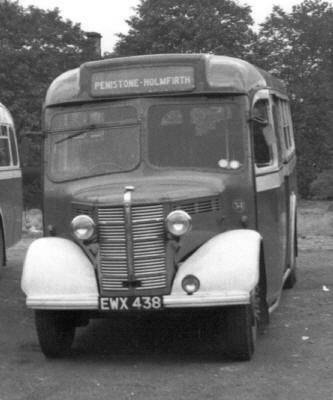 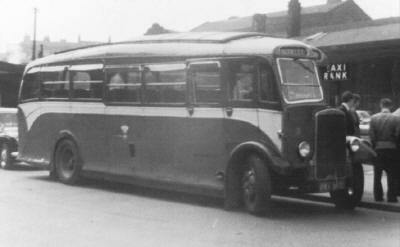 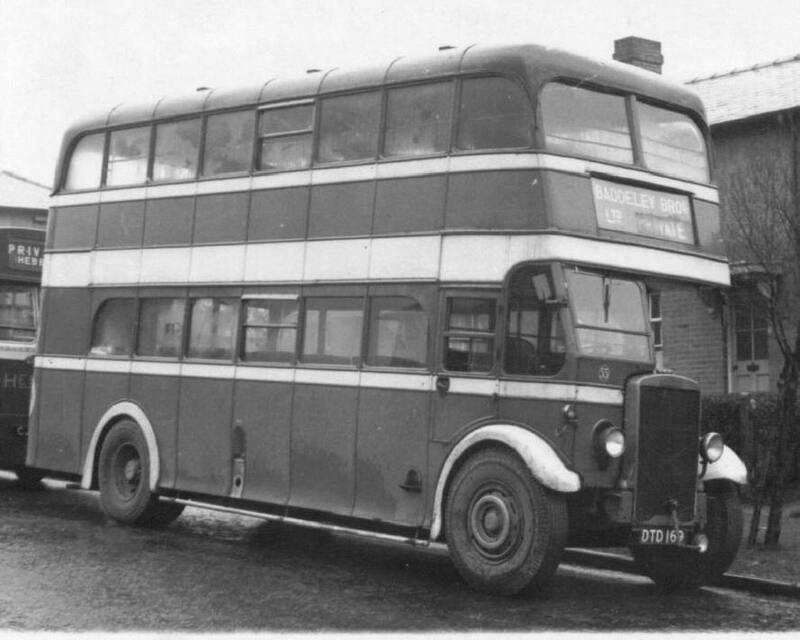 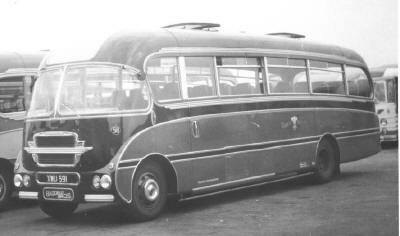 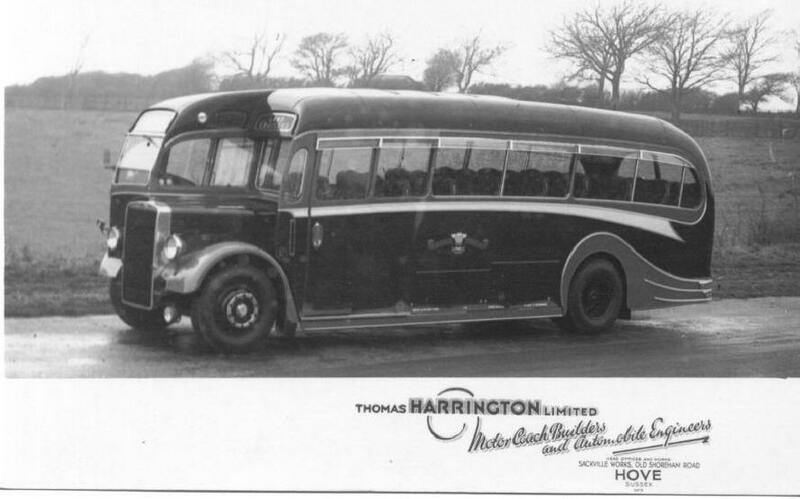 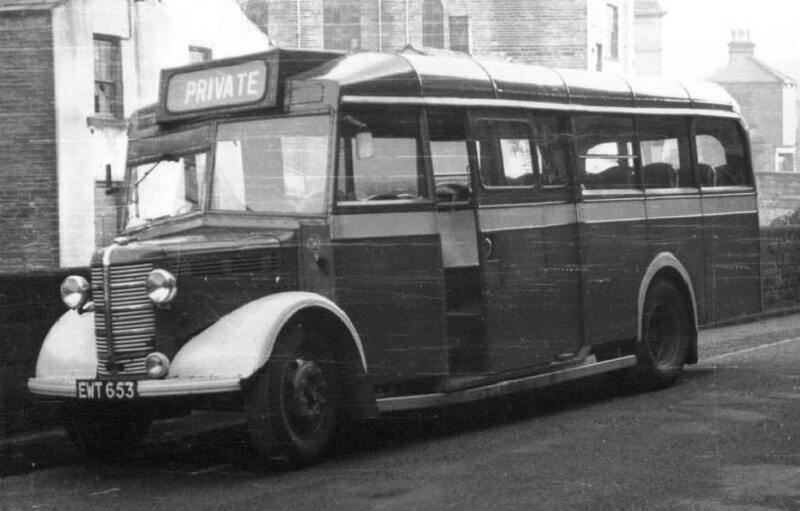 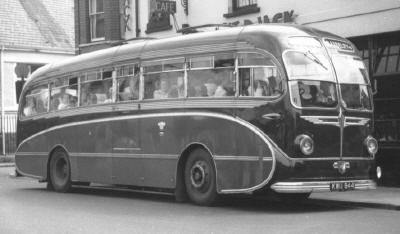 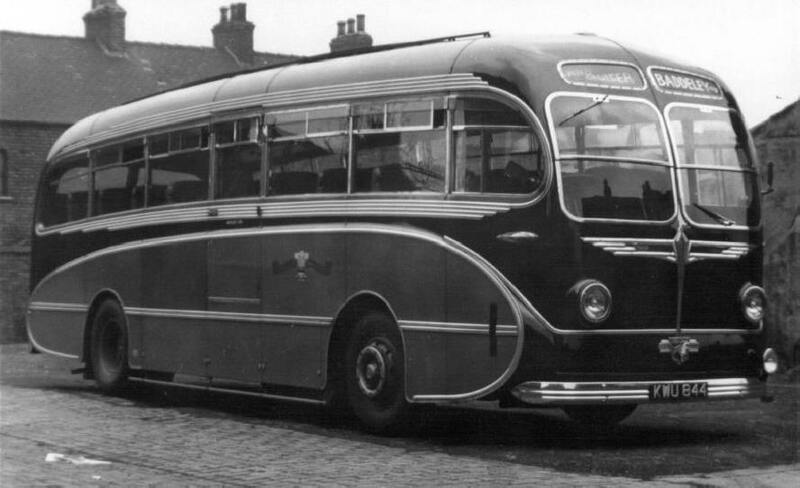 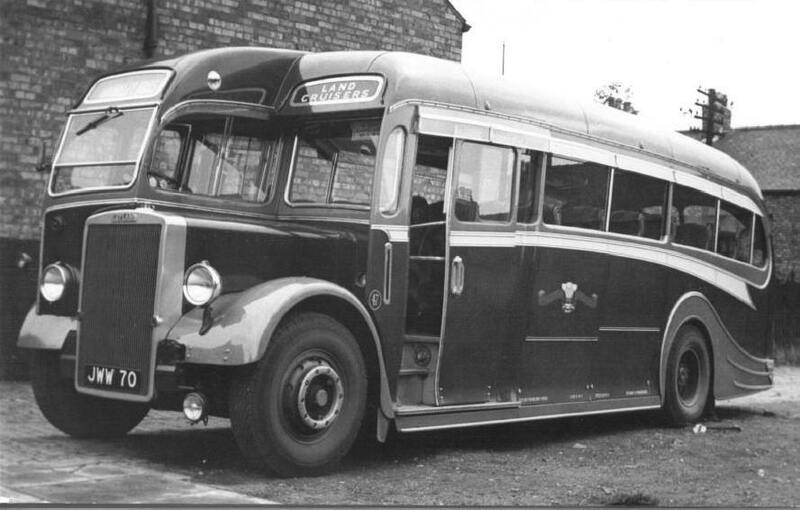 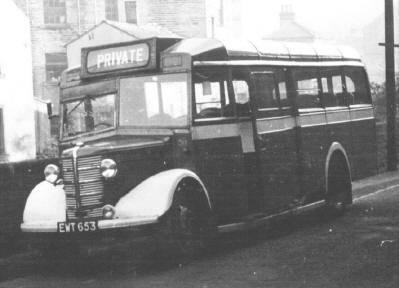 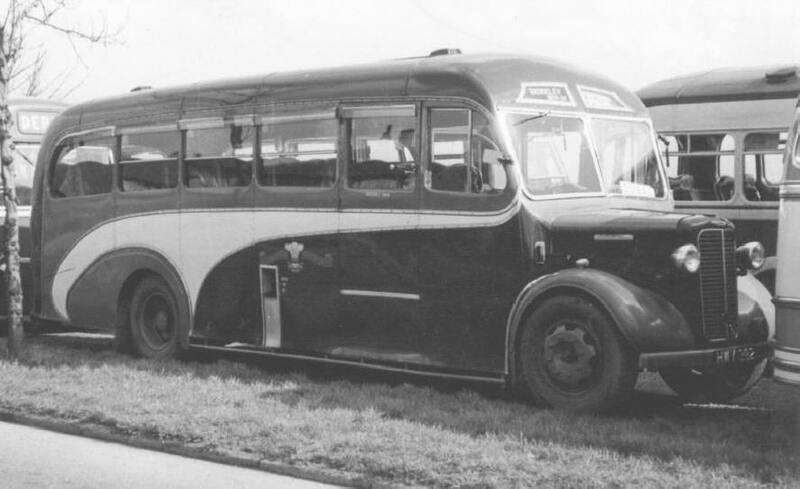 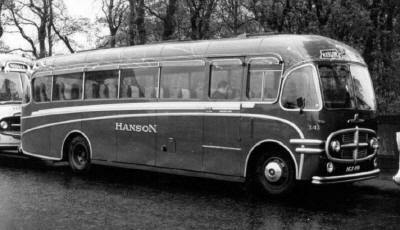 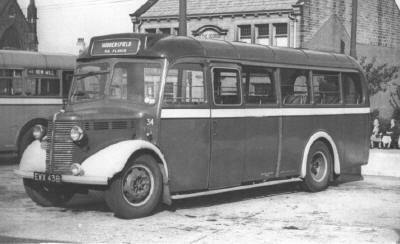 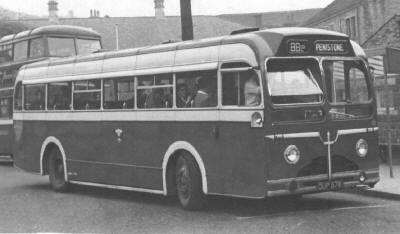 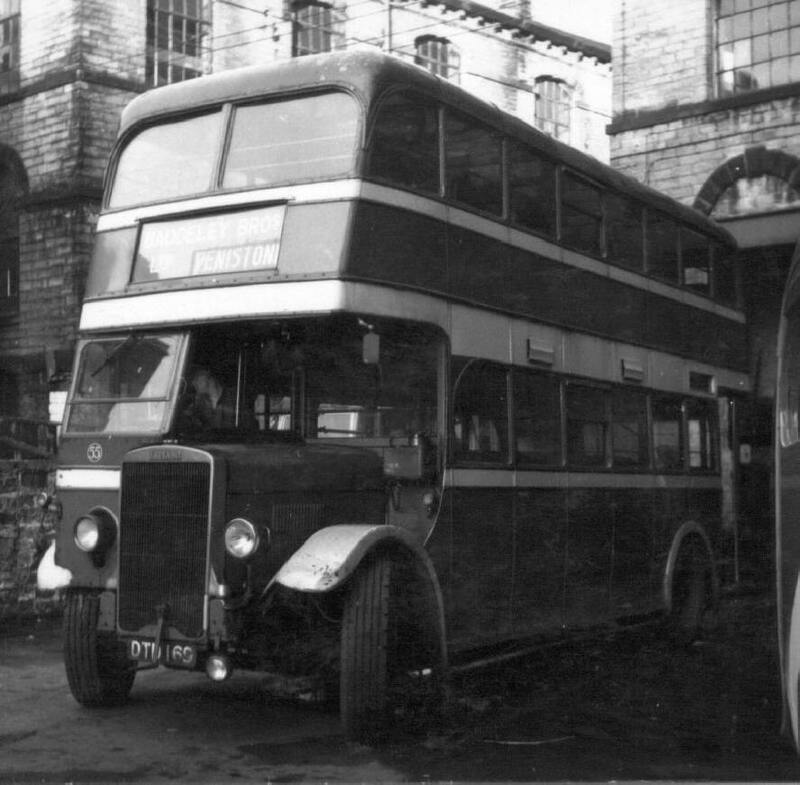 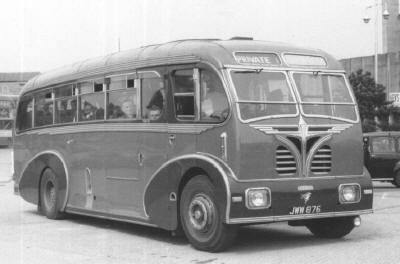 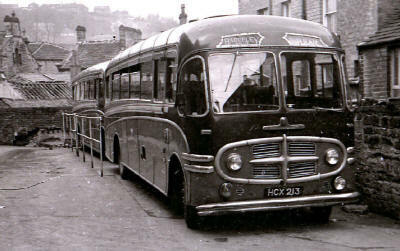 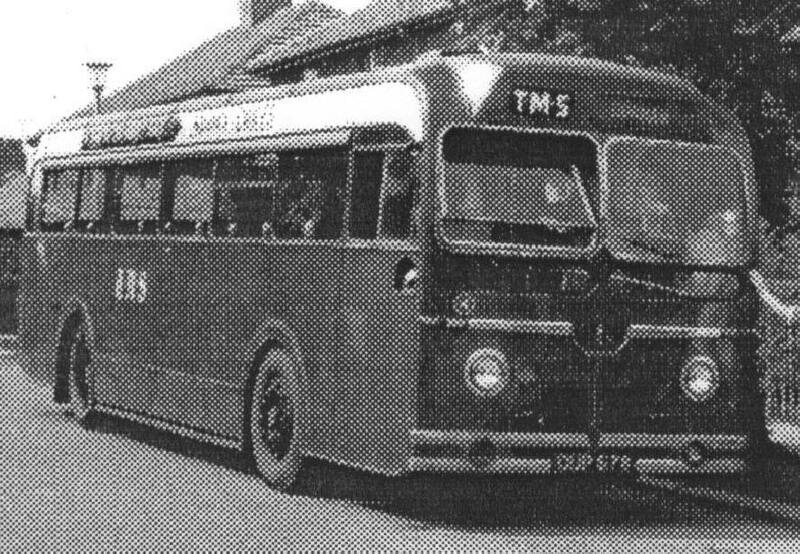 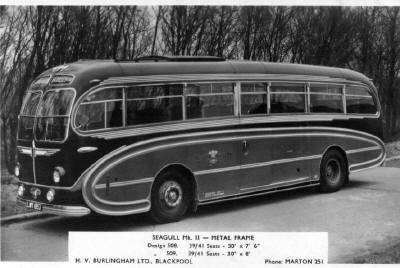 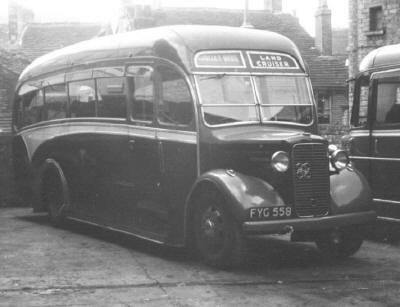 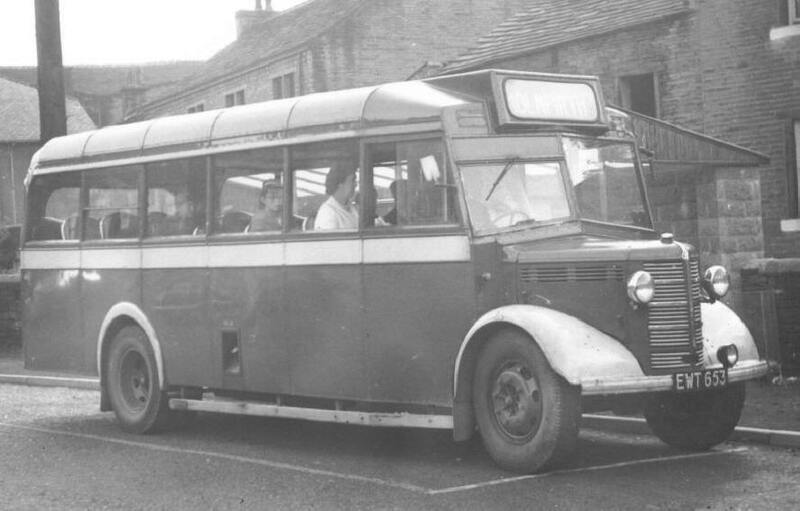 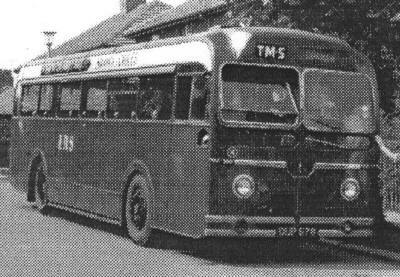 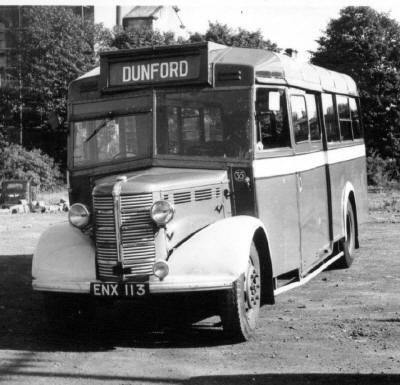 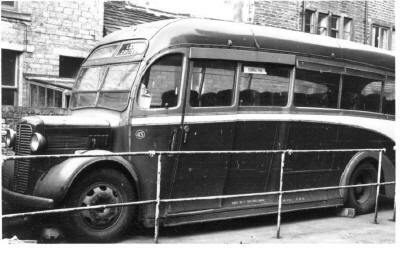 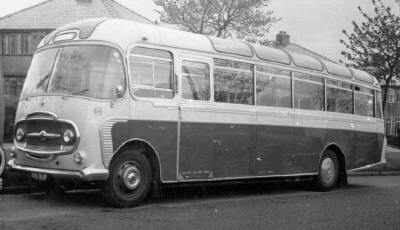 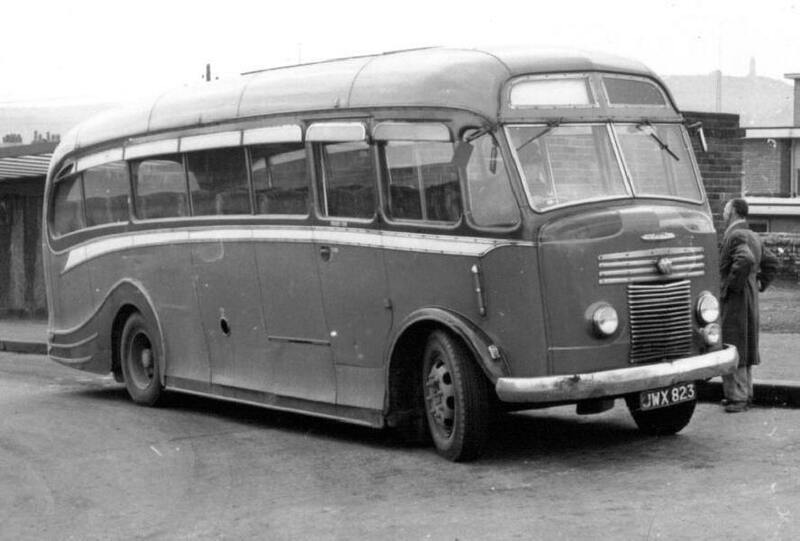 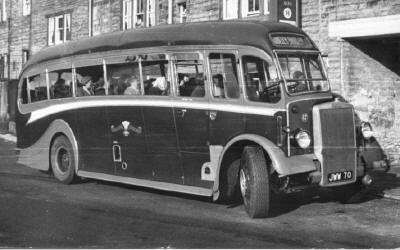 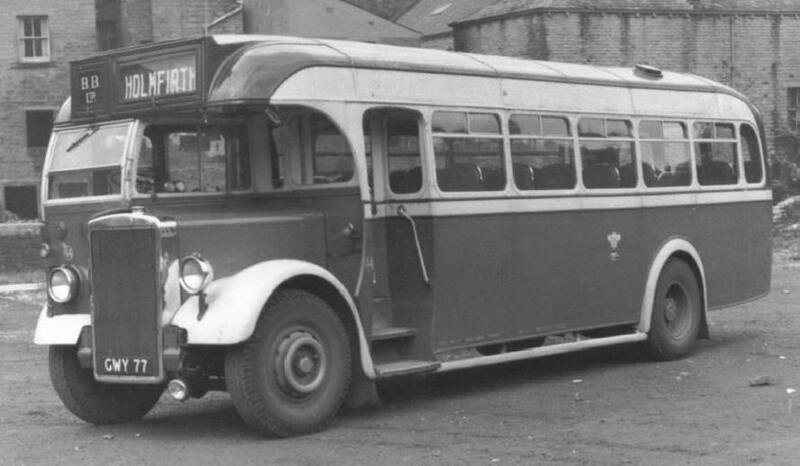 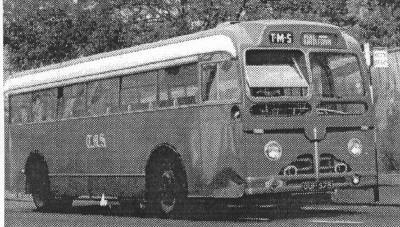 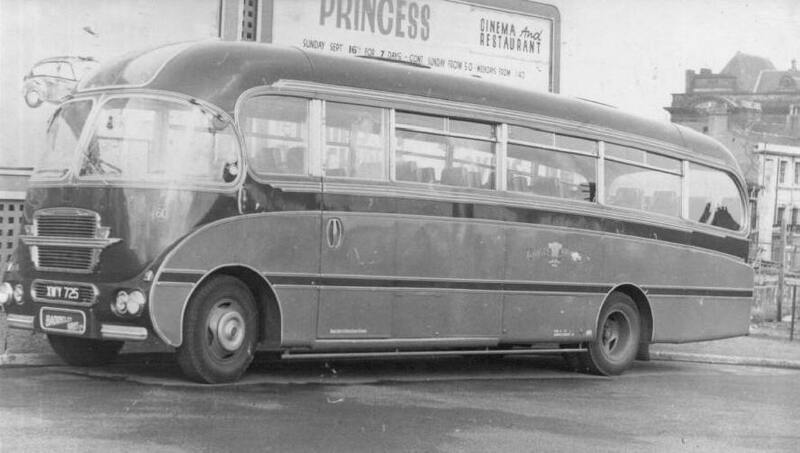 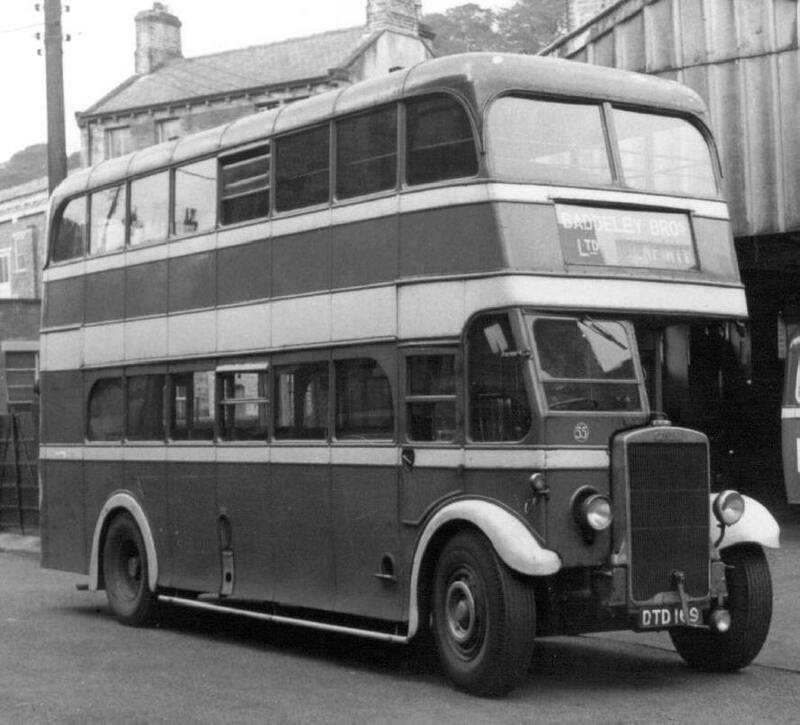 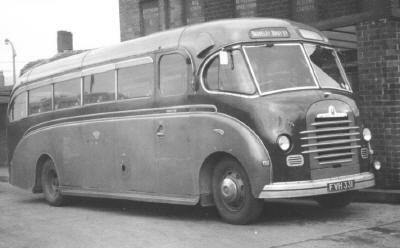 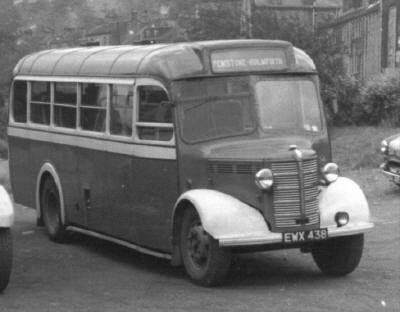 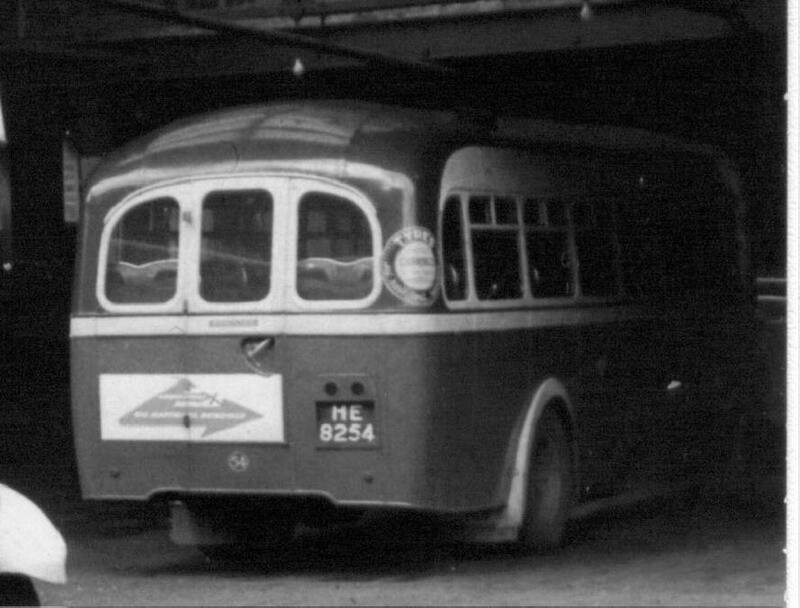 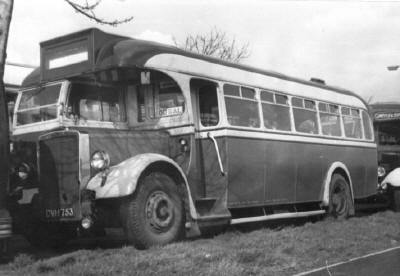 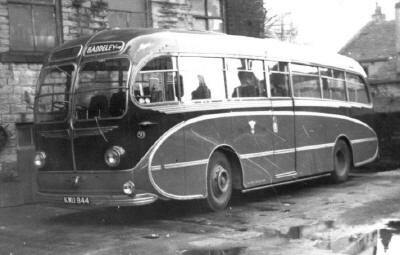 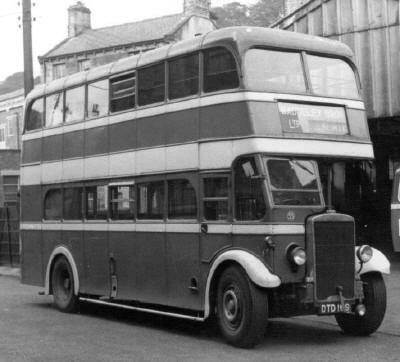 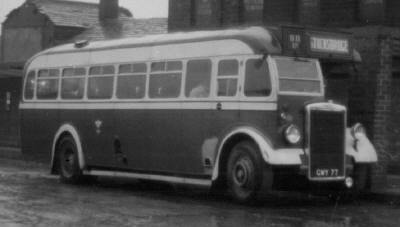 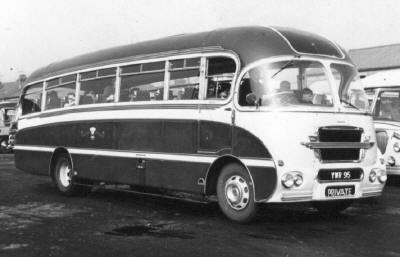 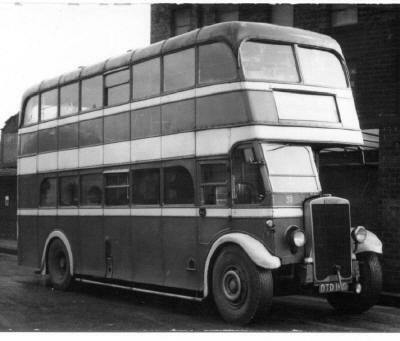 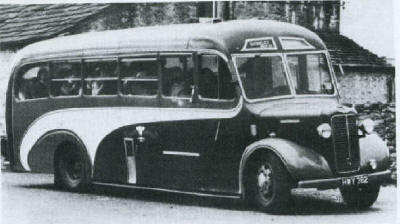 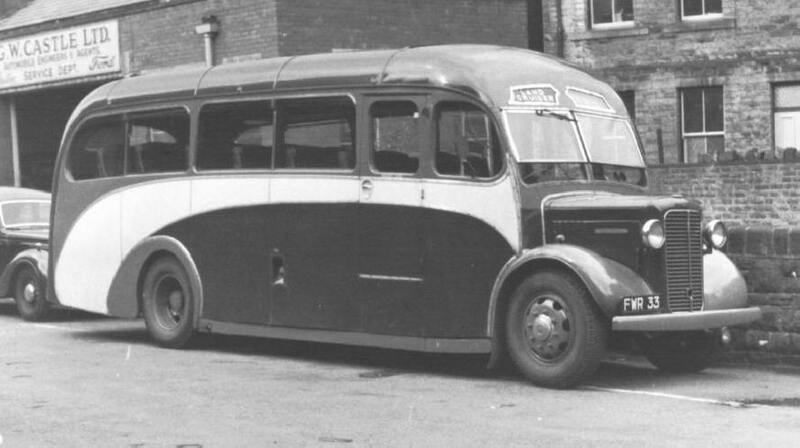 The Huddersfield-Scholes were not resumed after the war, and Holmfirth-Huddersfield was operated by Huddersfield Corporation Transport. The Huddersfield to Sheffield route was curtailed after a notable sitting of the Yorkshire Traffic Commissioners in the early ‘thirties, when the application was started at 4.45p.m. in the afternoon and continued until 1.55a.m. 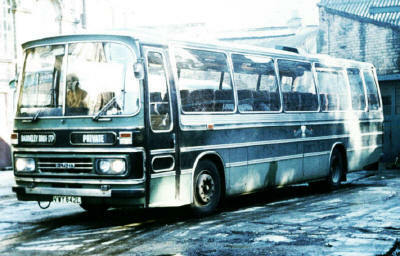 the following morning! At that time, the commissioners were Mr. Joseph Farndale (Chairman); Sir John Quarmby and Alderman Law. A licence was granted to Baddeley’s to work between Huddersfield and Deepcar and this service is was still in operation when the company was sold to West Yorkshire P.T.E. 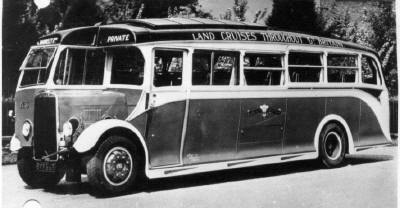 Also noteworthy, is that Mr. Joe Rogers, was passenger secretary of the P.V.O.A. 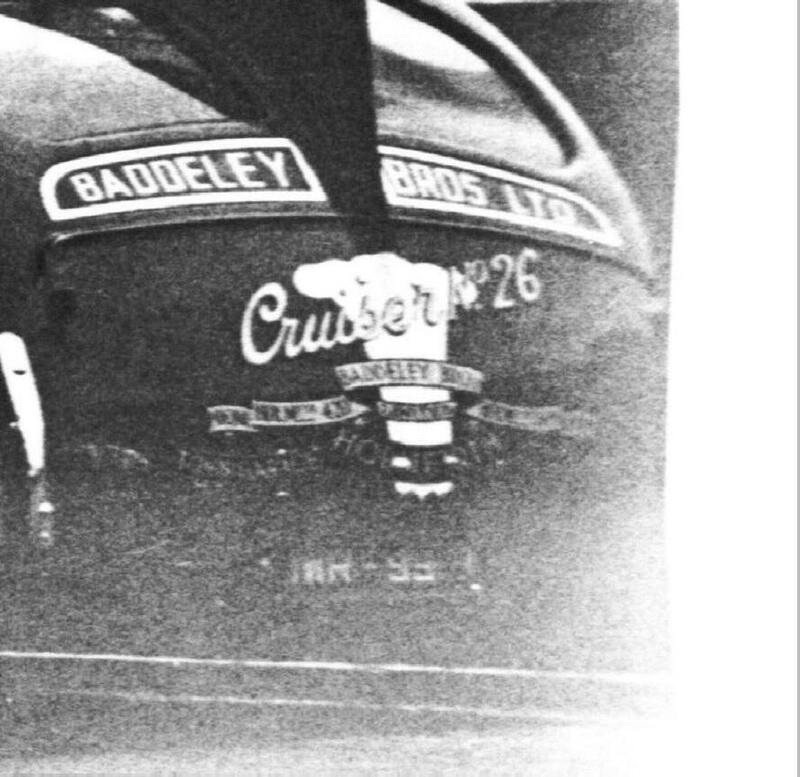 for Yorkshire, was a witness for Baddeley Bros. In 1933, a haulage company was acquired and services were operated daily between the Holme Valley and Liverpool and Holme Valley and Goole. 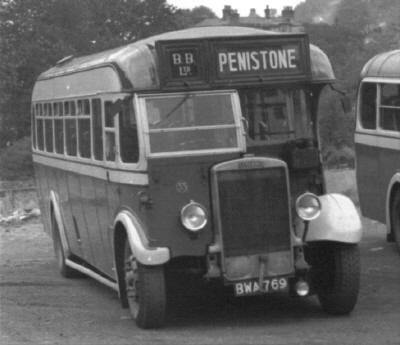 In due course, this section was acquired by British Road Services under nationalisation, and when freed this side was not resumed. Baddeley Bros. operated stage carriage, excursions and tours, and contract work. 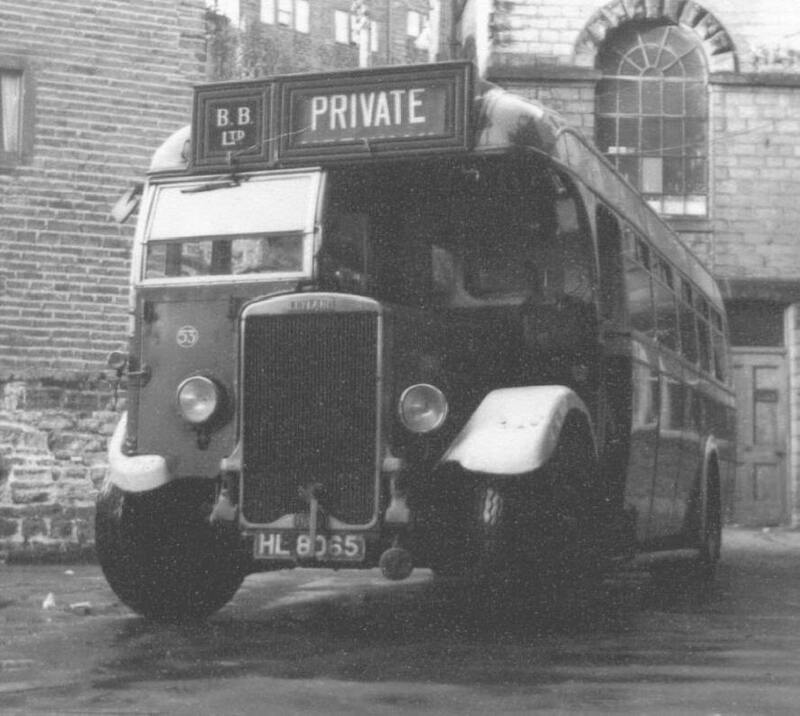 Stage carriage services still in operation when the company was sold to West Yorkshire P.T.E. 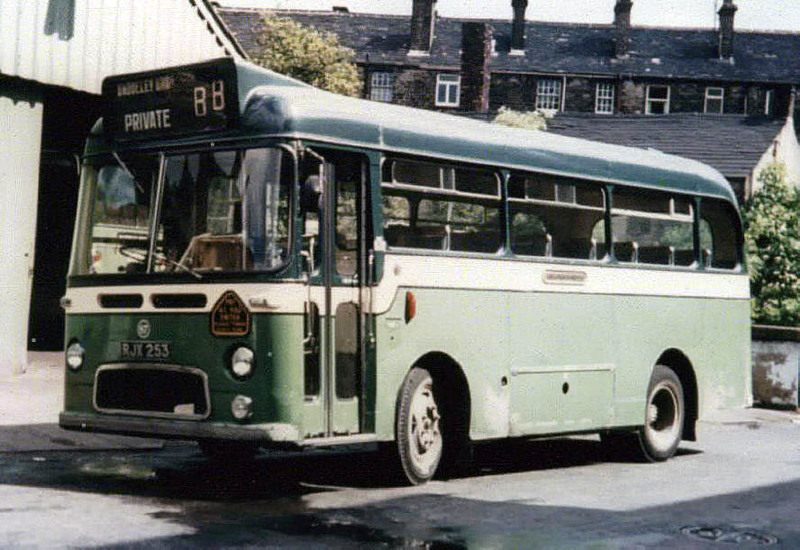 were: Huddersfield-Deepcar via New Mill and Stocksbridge; Holmfirth­Penistone via Flouch; Holmfirth-Penistone via Dunford Bridge; Holmfirth-Clayton West (three times daily on behalf of the National Coal Board); Holmfirth-Crow Edge via Victoria; Huddersfield-Crow Edge via Victoria. 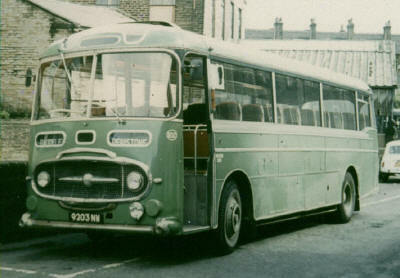 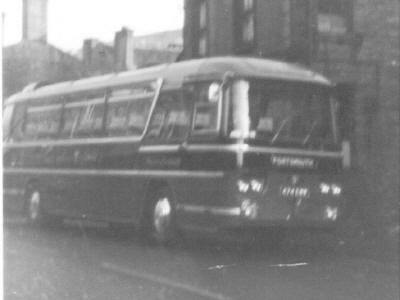 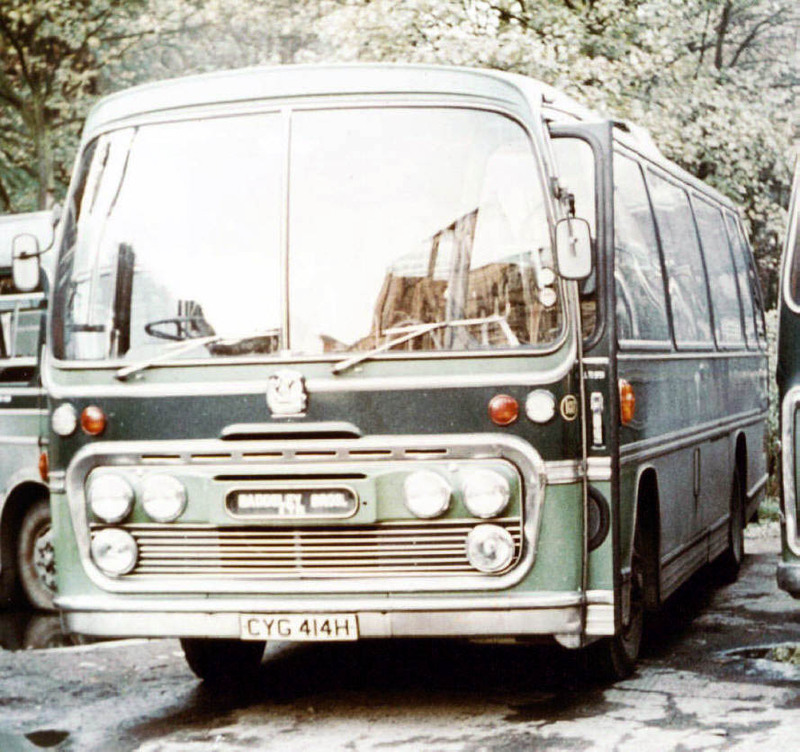 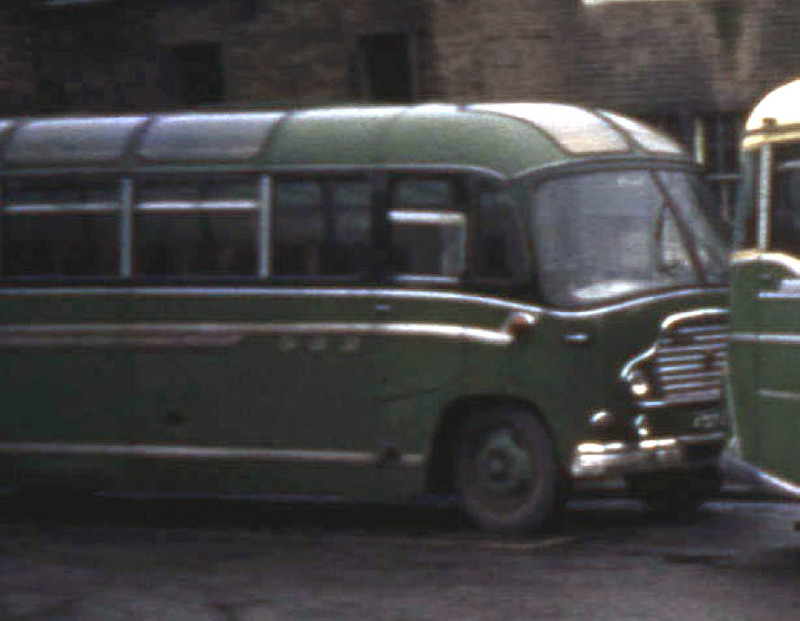 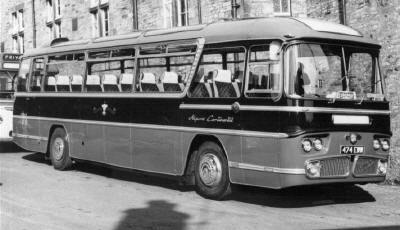 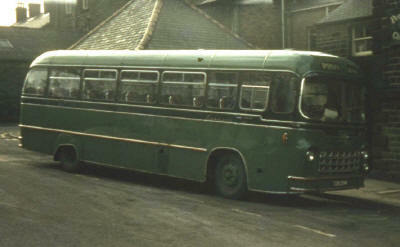 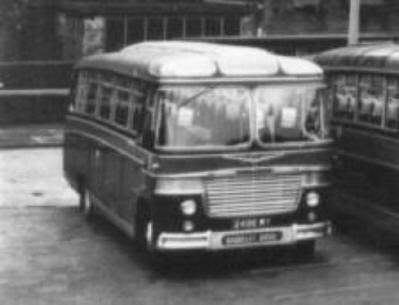 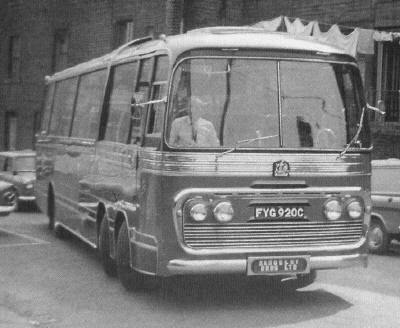 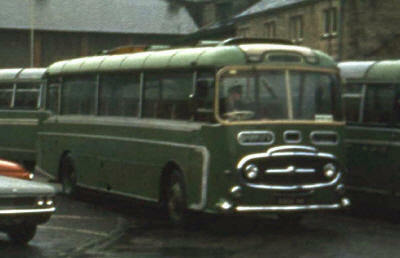 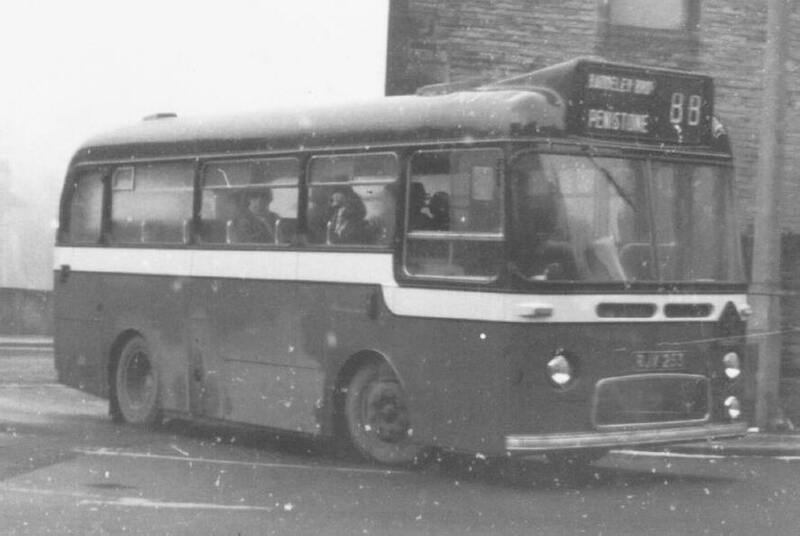 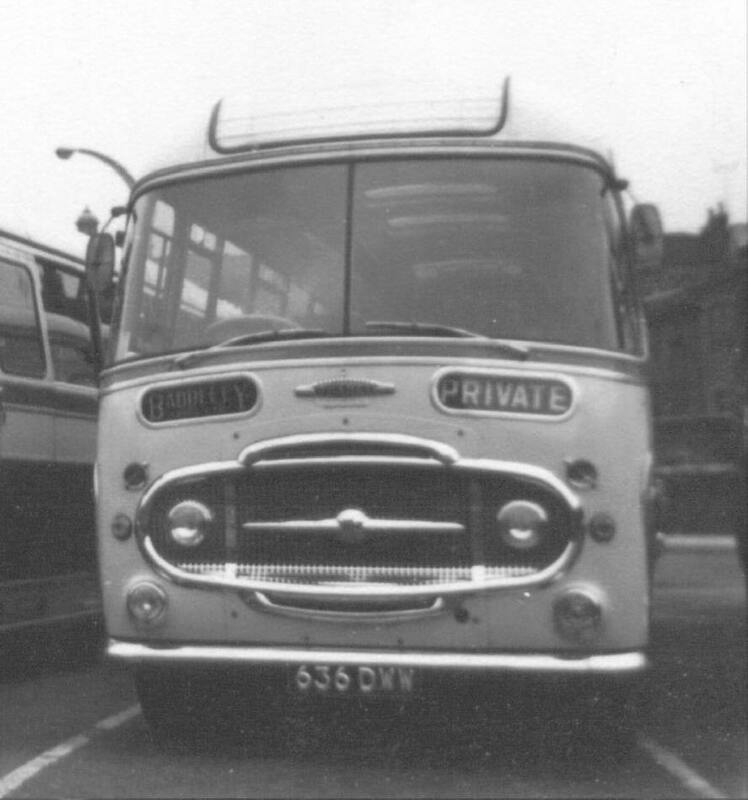 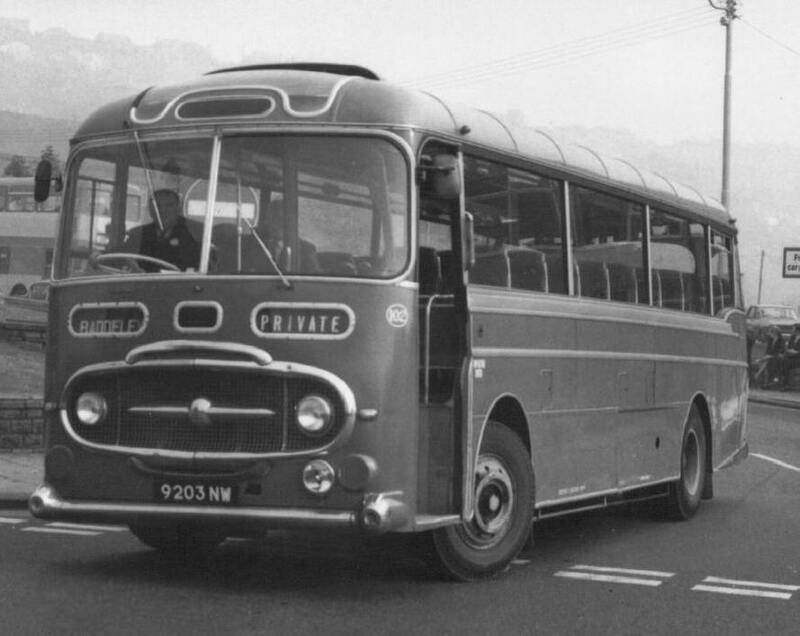 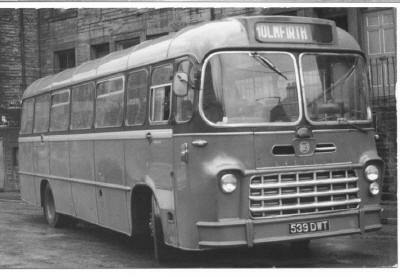 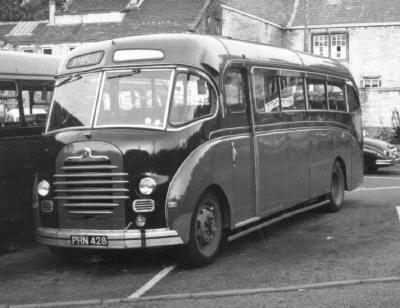 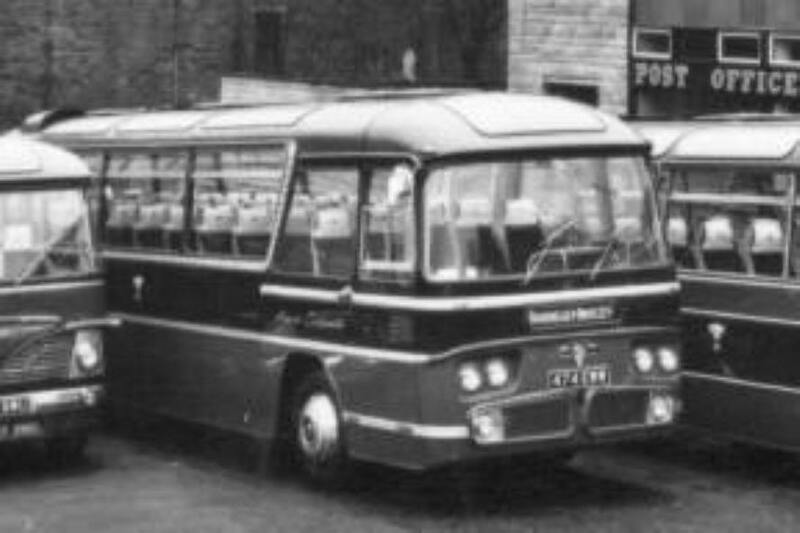 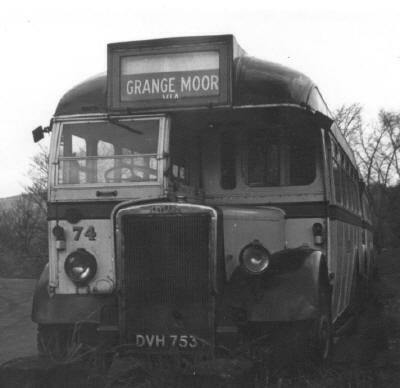 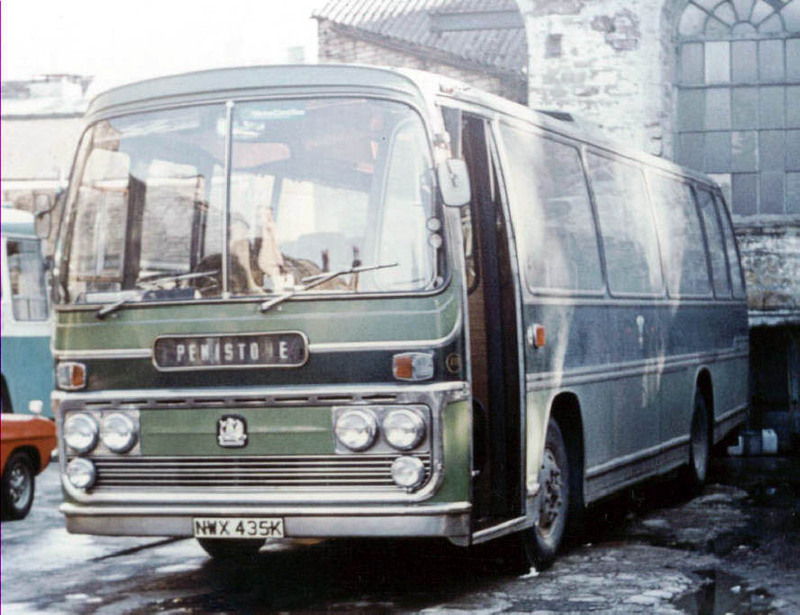 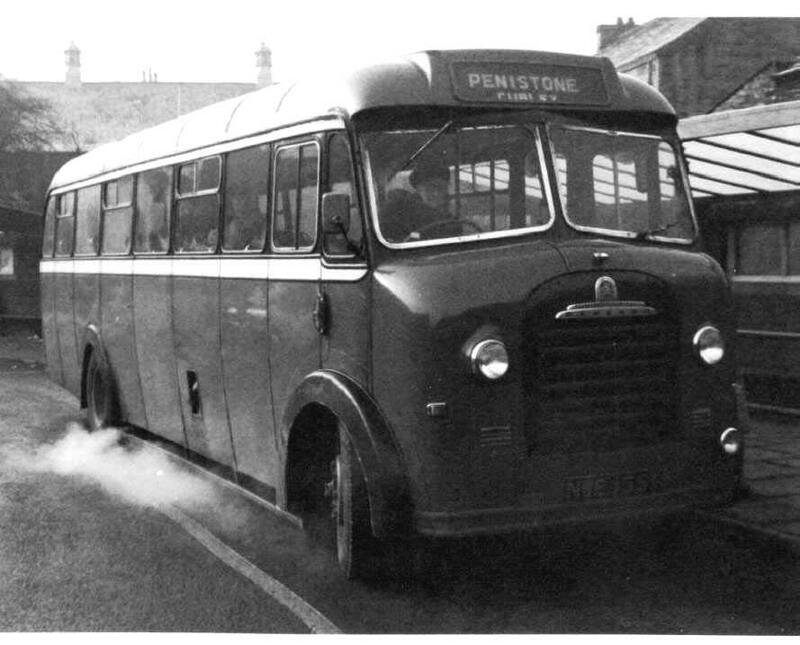 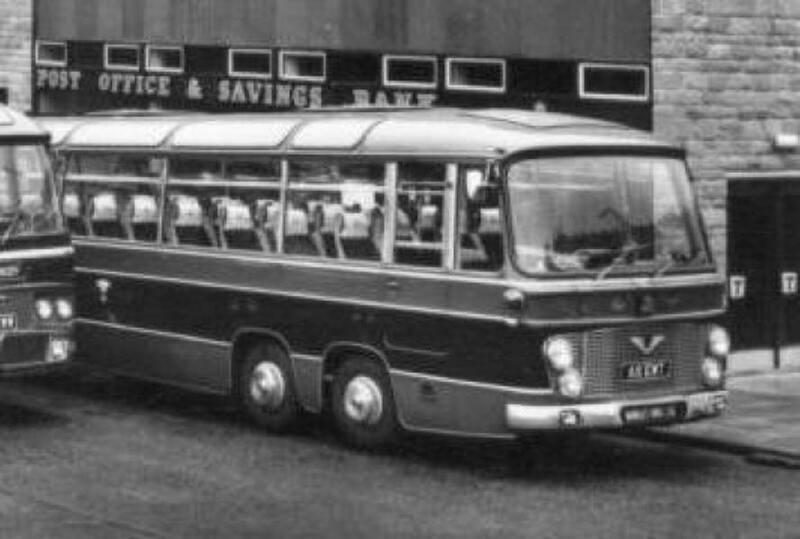 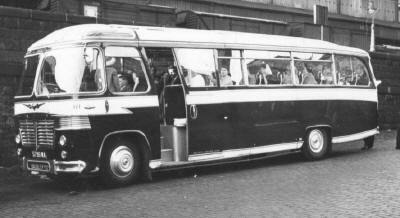 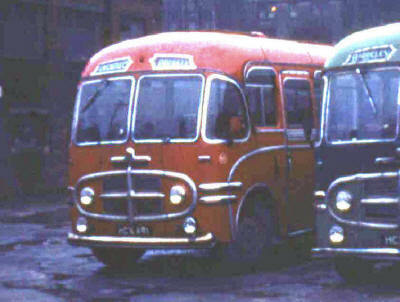 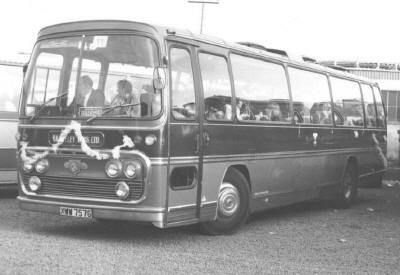 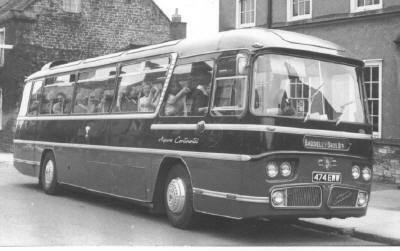 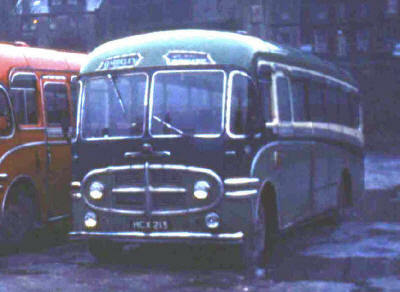 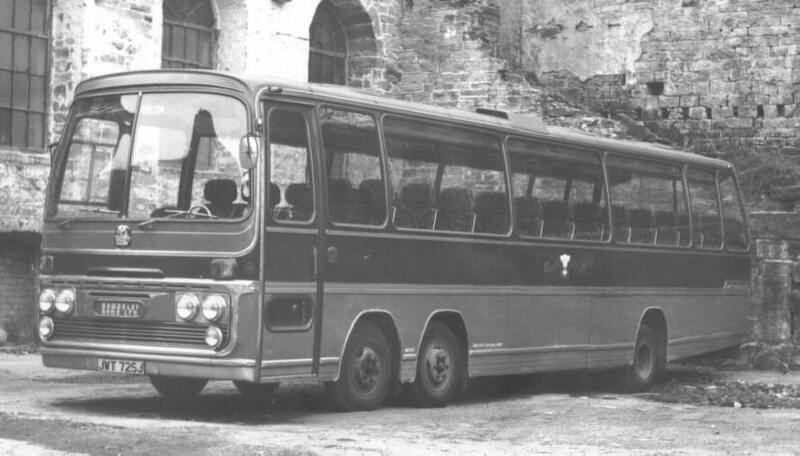 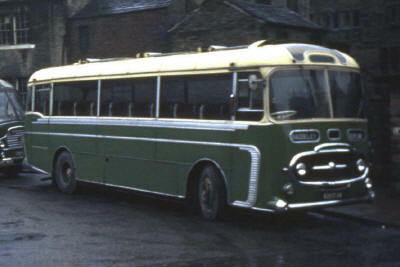 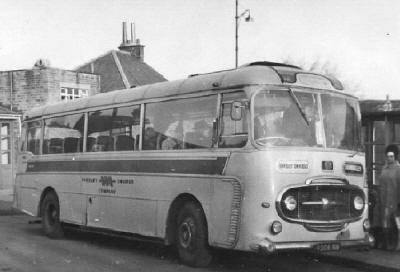 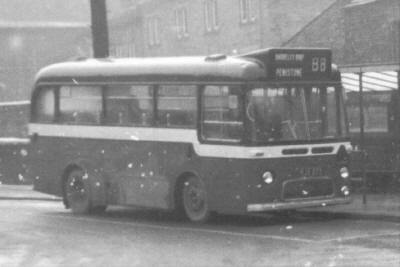 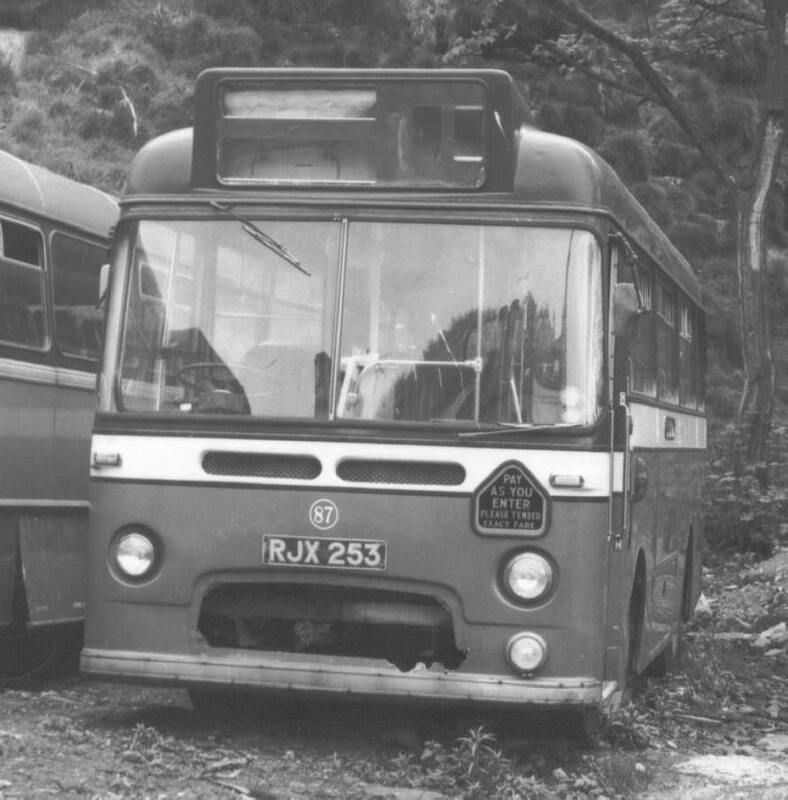 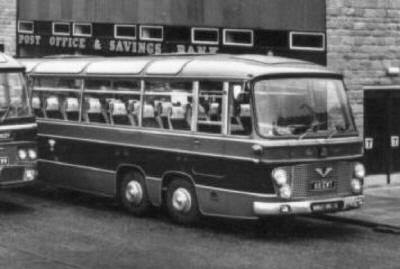 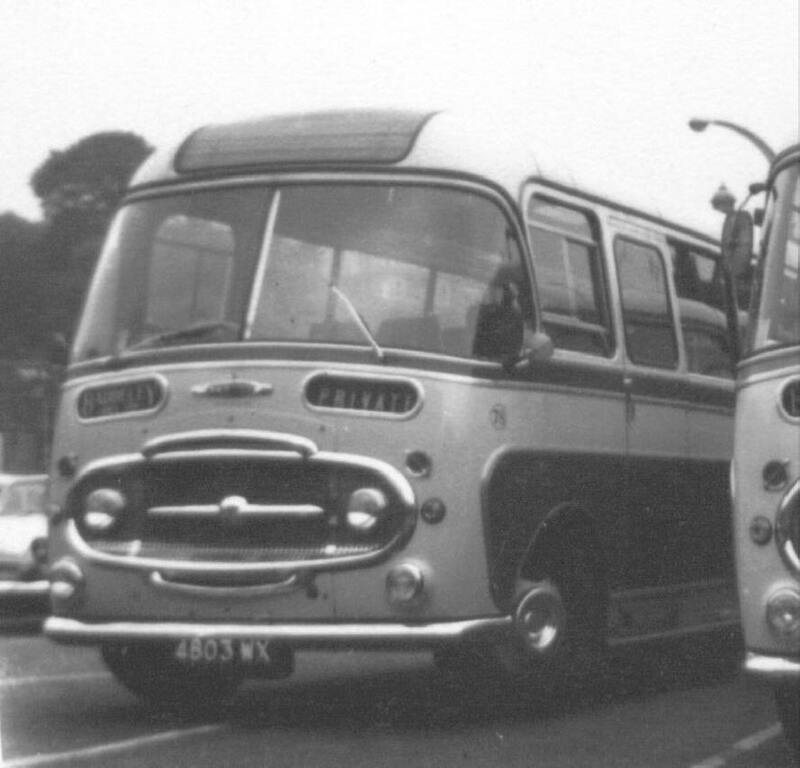 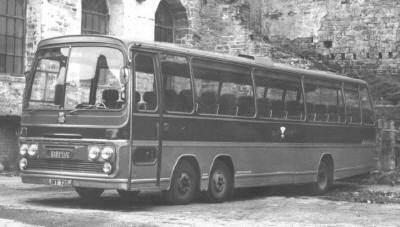 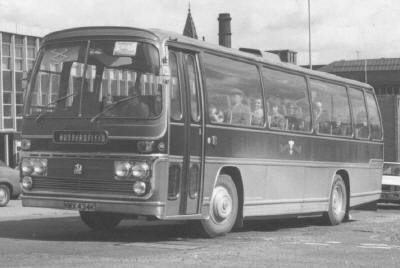 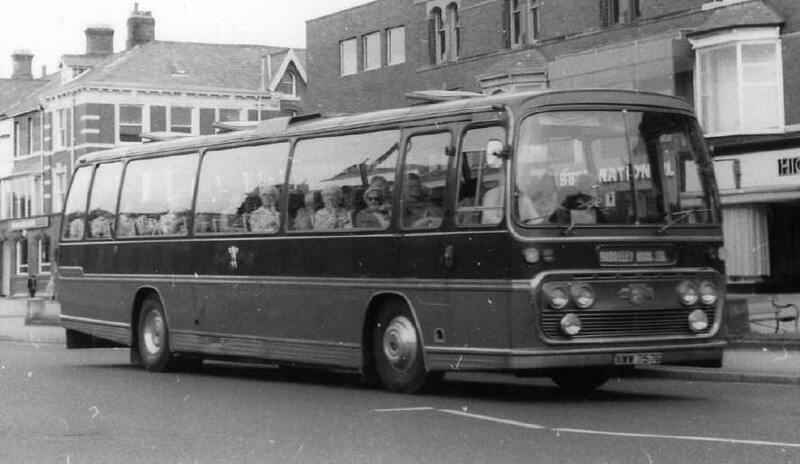 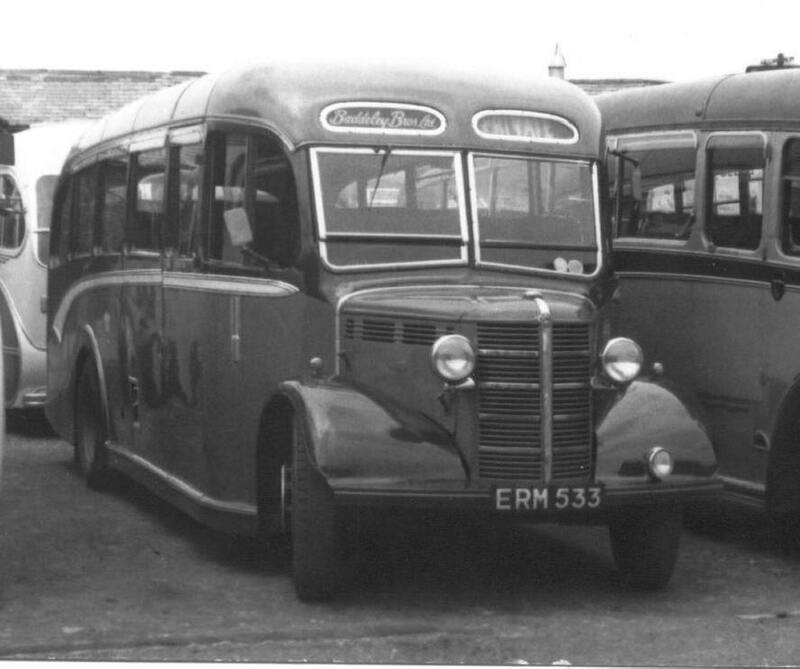 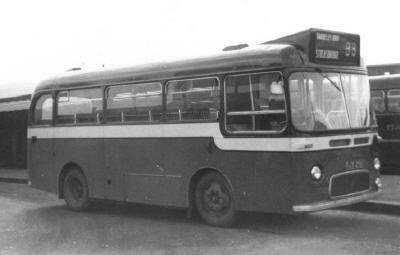 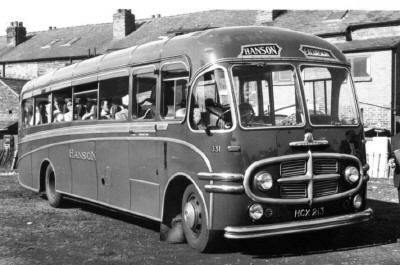 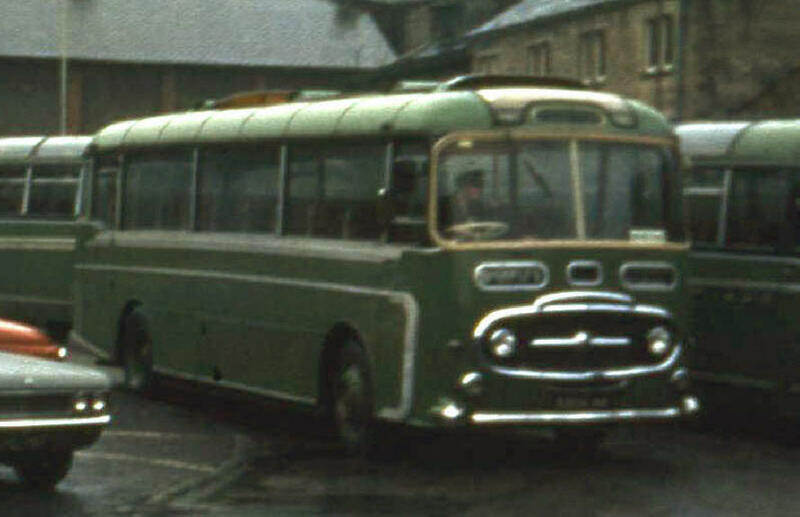 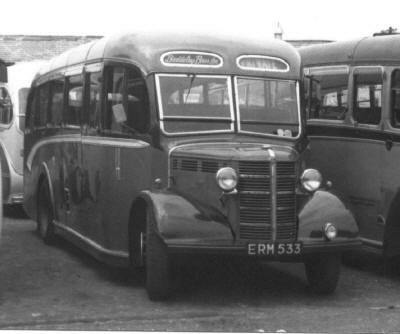 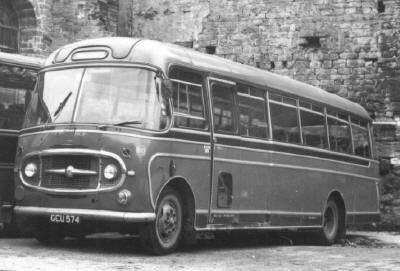 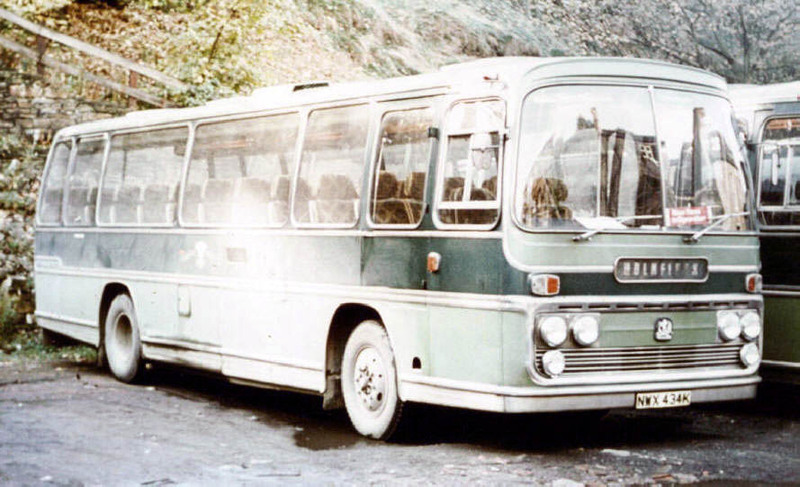 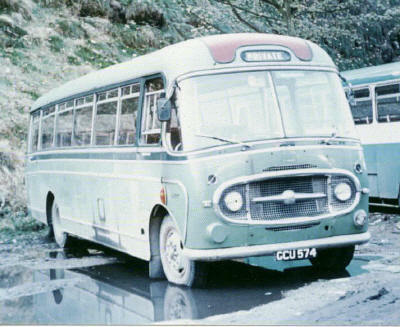 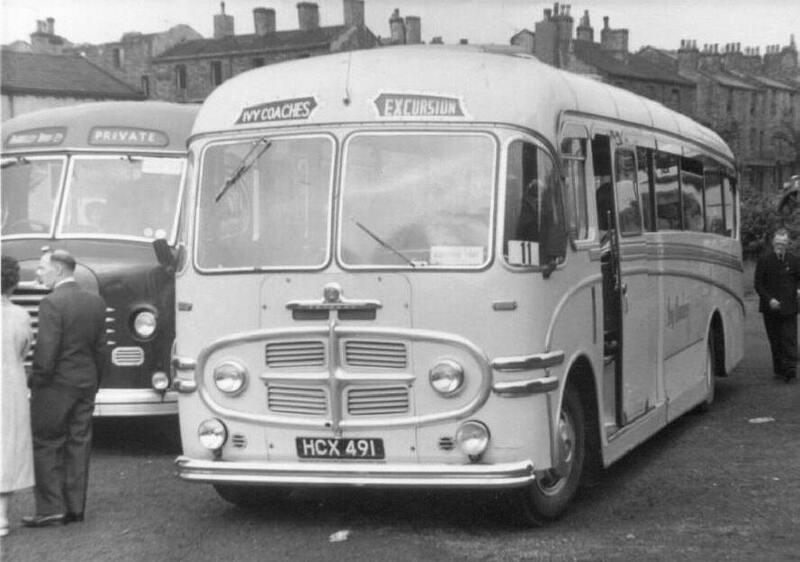 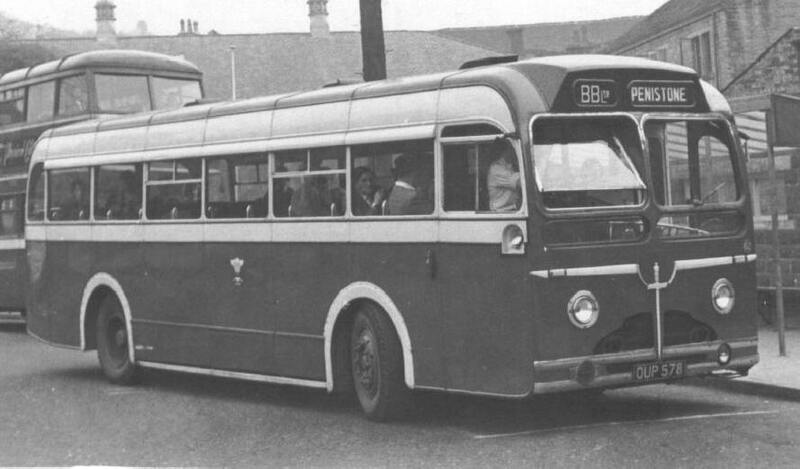 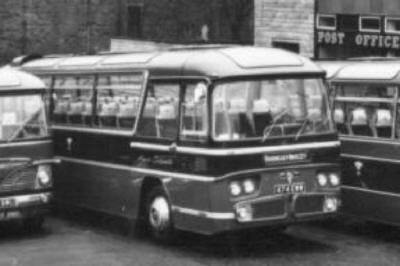 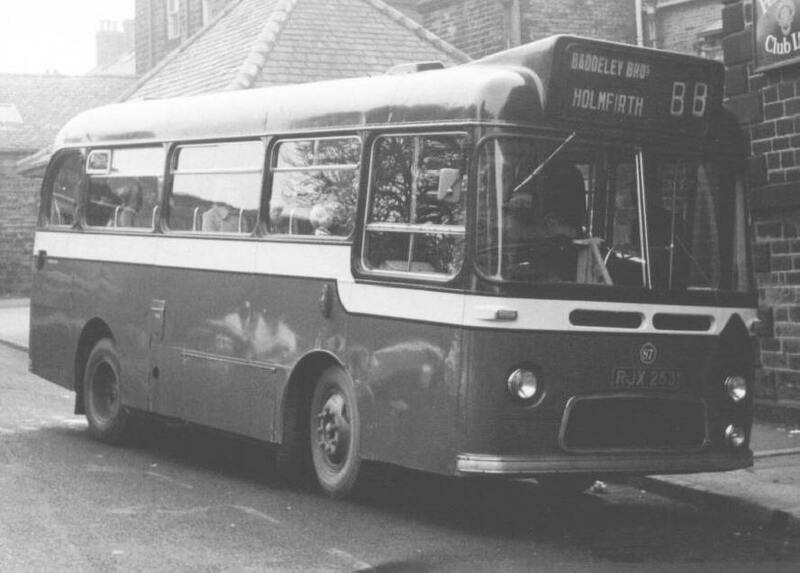 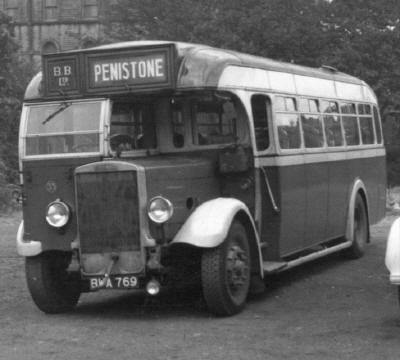 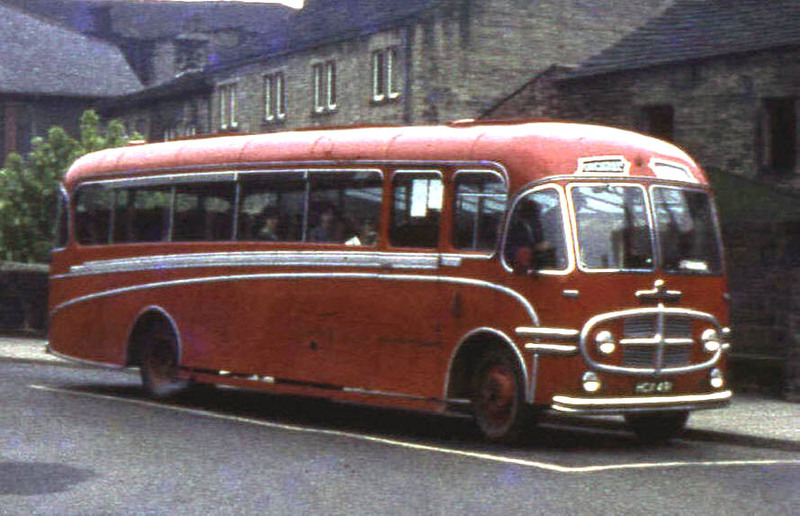 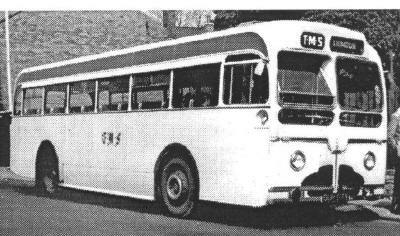 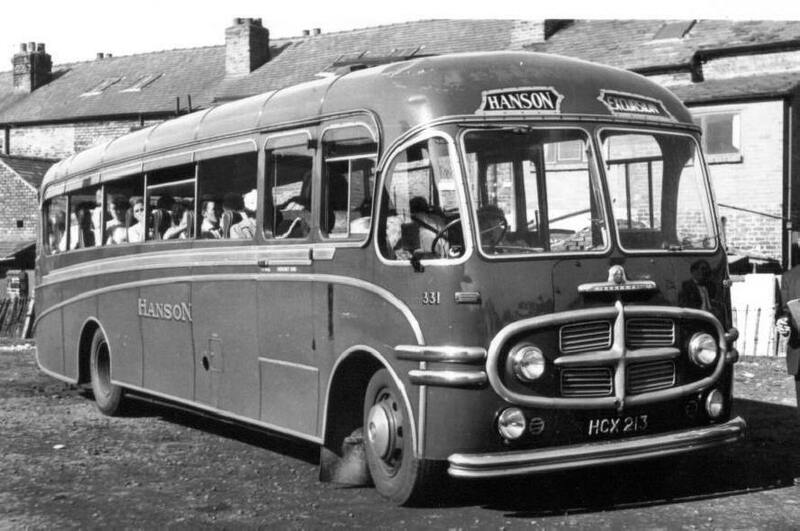 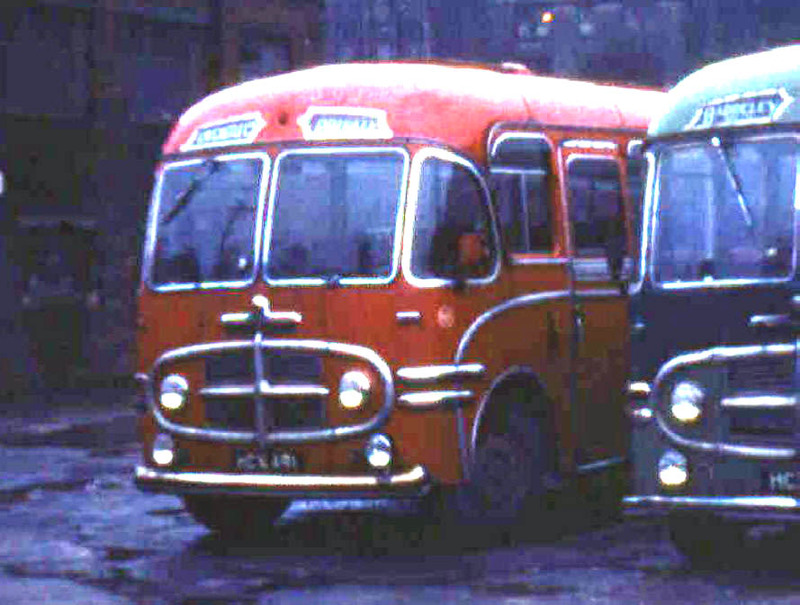 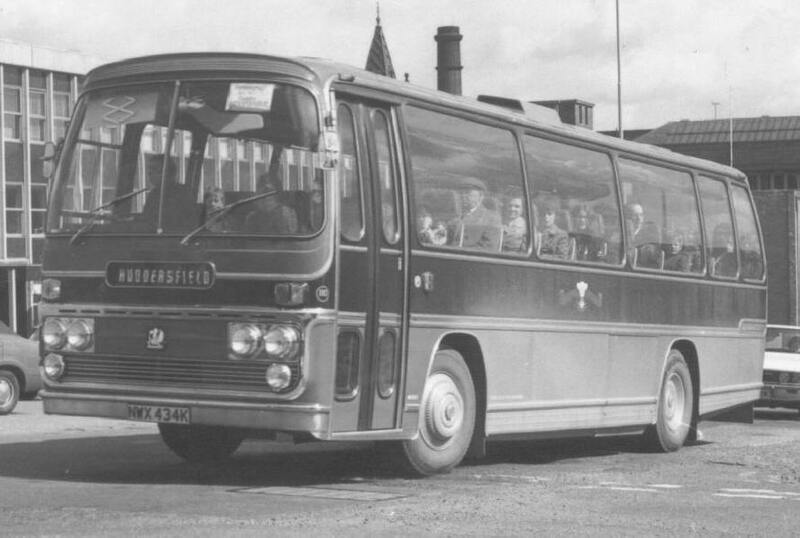 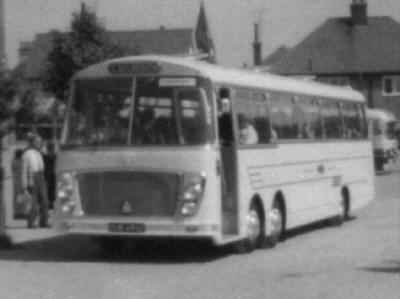 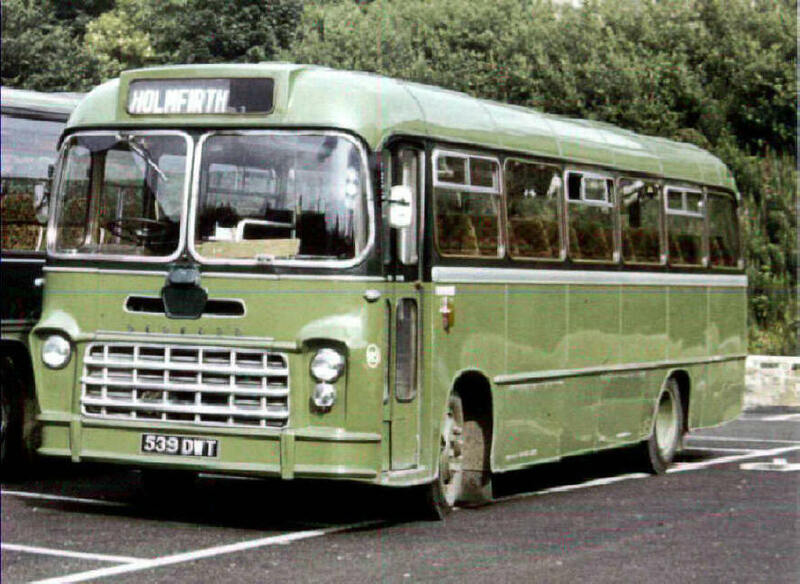 The company holds 123 excursion licence destinations by April, 1964 from Holmfirth, 121 from Meltham, 82 from Stocksbridge and 62 from Huddersfield. 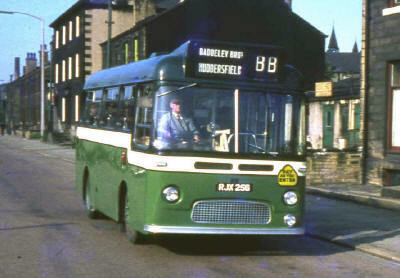 The majority of these destinations are common to all four starting points and are linked for the purpose of economy, for in country districts like the Holme Valley in Yorkshire, it is only at holiday periods that separate operation from each point is justified, and without this linkage, the smaller towns and villages would be deprived of all excursion facilities. 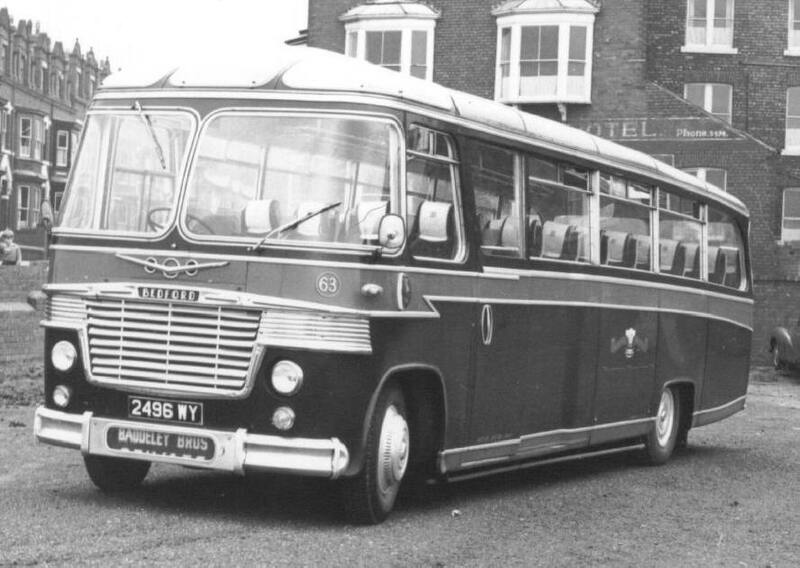 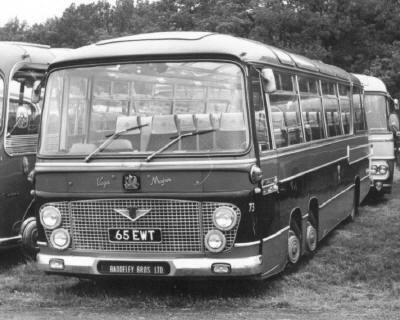 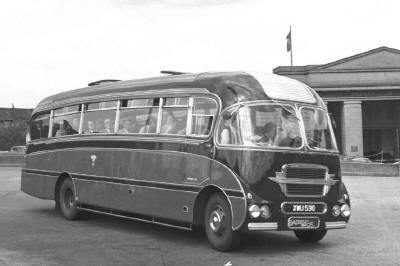 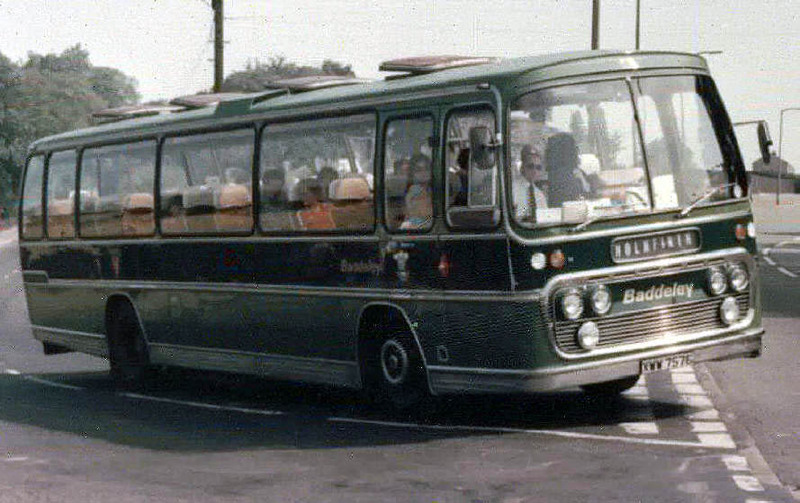 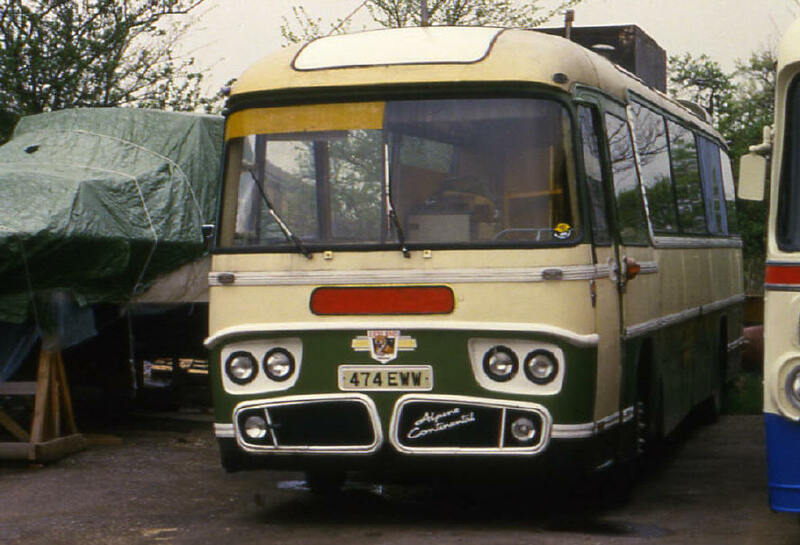 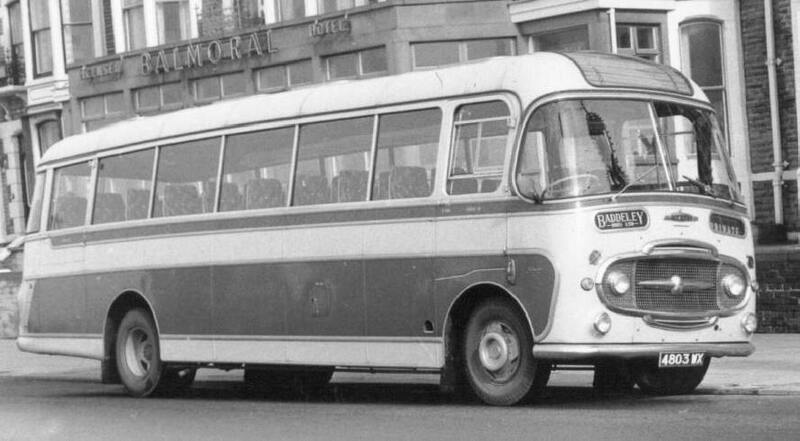 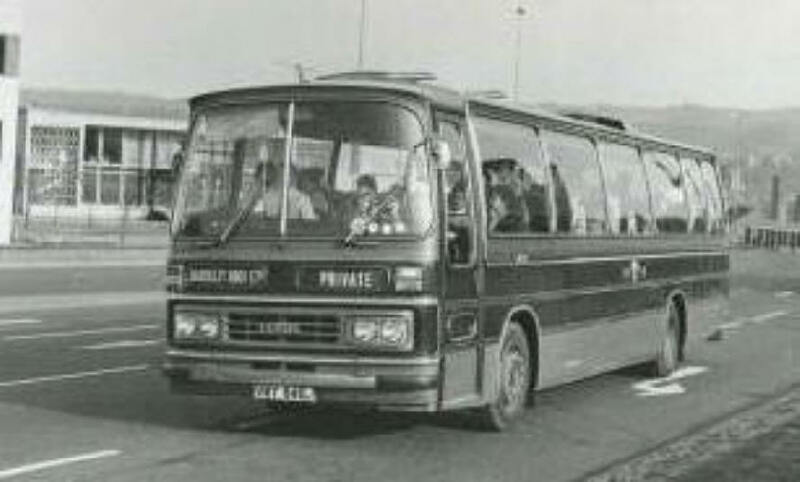 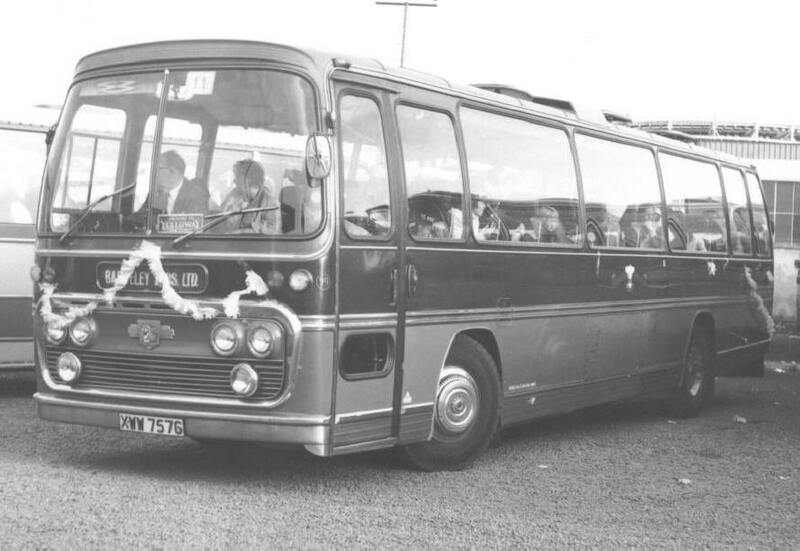 During the sixties and seventies Baddeley’s found that the longer distance excursions were proving the most popular, and the excursion which is breaking all records in 1964 was the new day trip via the motorway to London Airport. 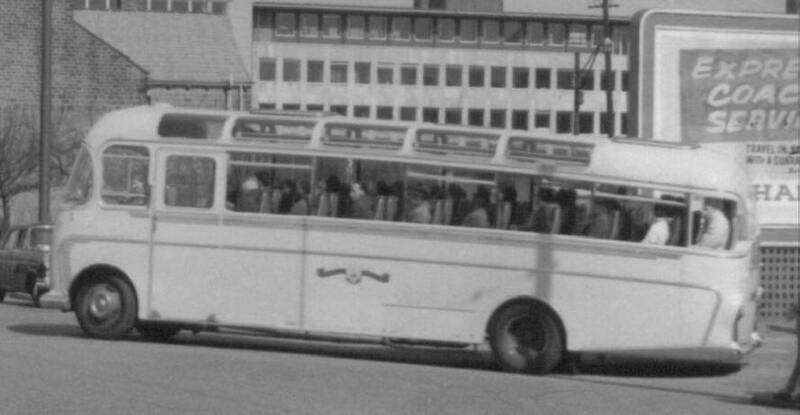 By the last week in September, 1,628 passengers had been carried, with an average loading of 37.8 in the new 49-51 seater coaches. 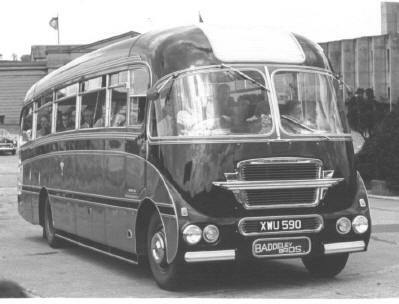 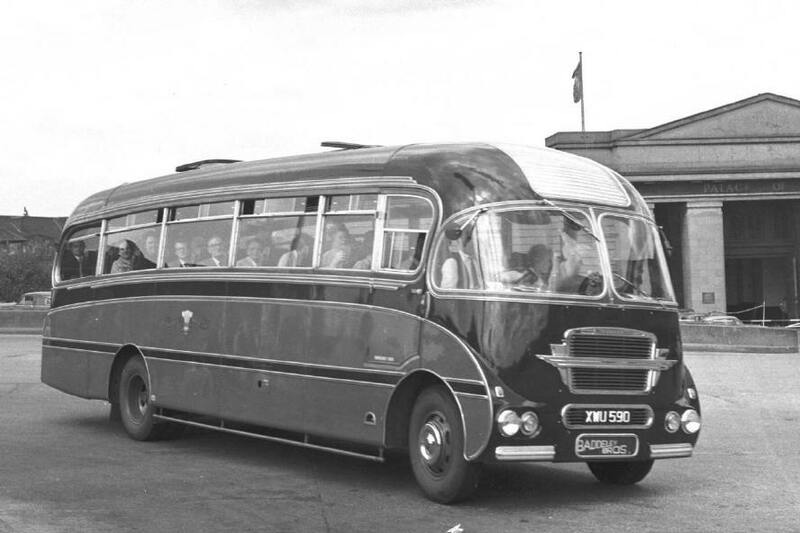 During 1962, a total of 861,709 passengers was carried on Baddeley vehicles, broken down into 493,575 on stage carriage, 28,134 on excursions and 340,000 on contract and private hire. 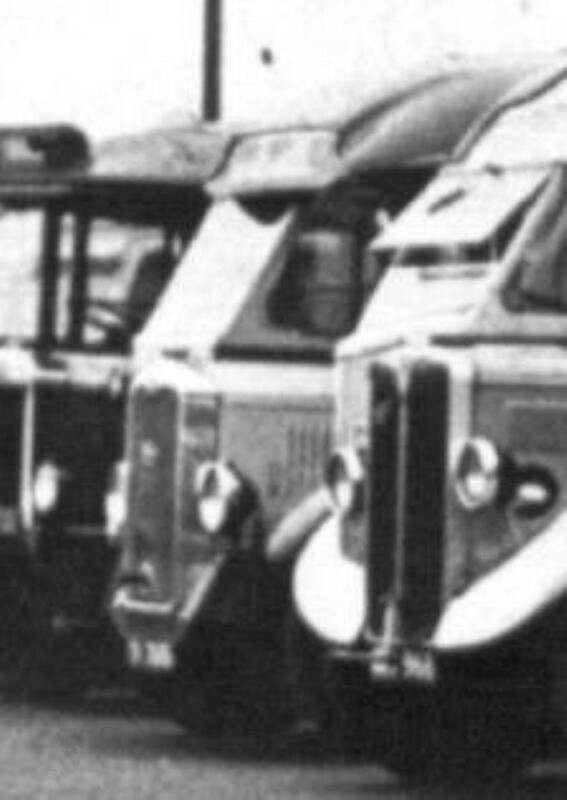 Total fleet mileage last year was 509,036. 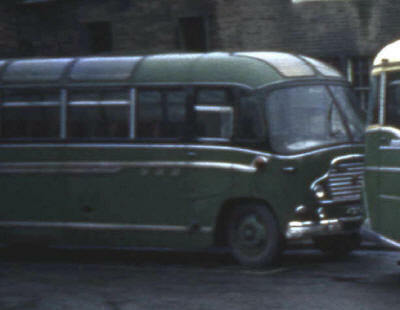 This required a daily staff of 32, rising at weekends to 40-44. Many of these employees were long service people, two with more than 30 years and several with more than 20 years. 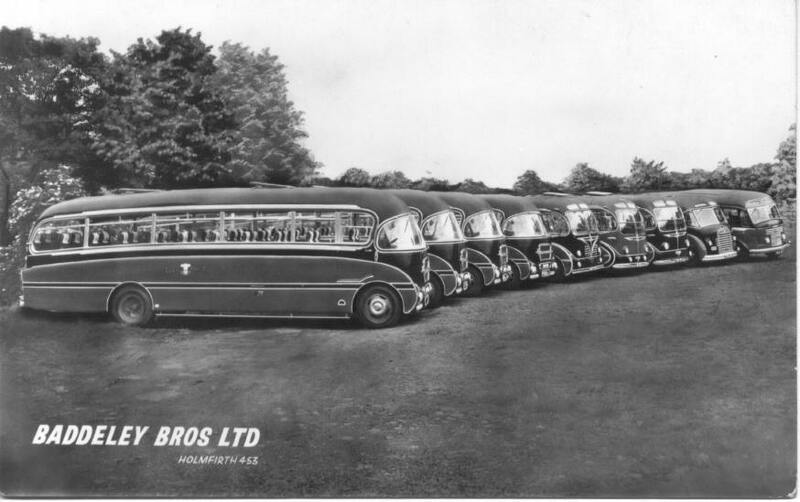 The fleet strength was about the same as it was at the end of the war, but the carrying capacity has increased by 20 per cent on the 23 vehicles, once where Burlingham bodies predominate, and seating is mainly in the range 41-51. 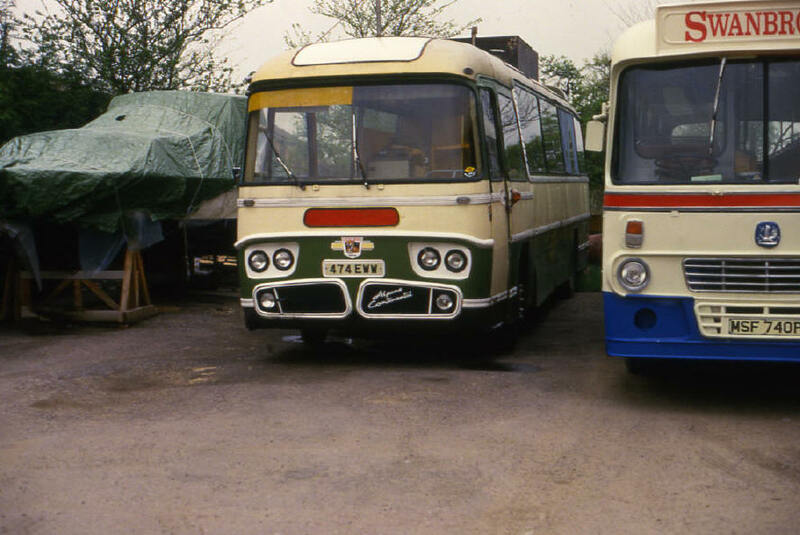 Chassis are mainly Bedford, but there are also several Leylands. 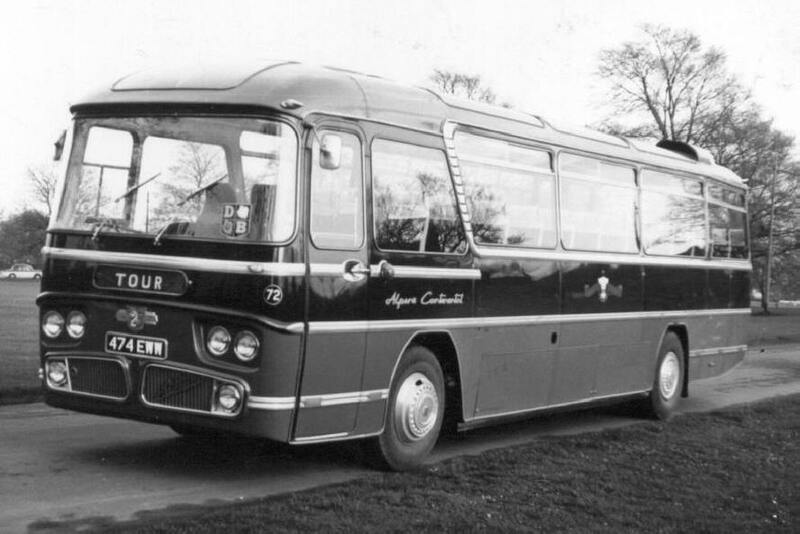 All mail going out from the office bears an attractive sticker on the envelope which depicts the latest coach—the 1964 one shows a Bedford VAL—and the artist changes the sketch whenever necessary. On the staff side, too, the company has adopted a novel approach, which is worth considering elsewhere. To get prospective employees to come from the large towns into the Holmfirth district, Baddeley’s purchased a number of houses, which were let to the staff at nominal rents. 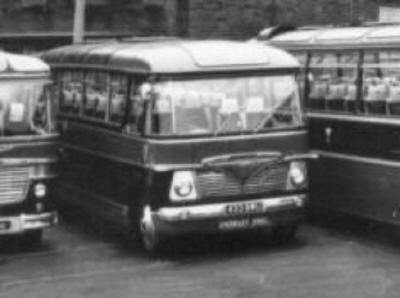 In the main garage in Hollowgate there are four 4Oft. 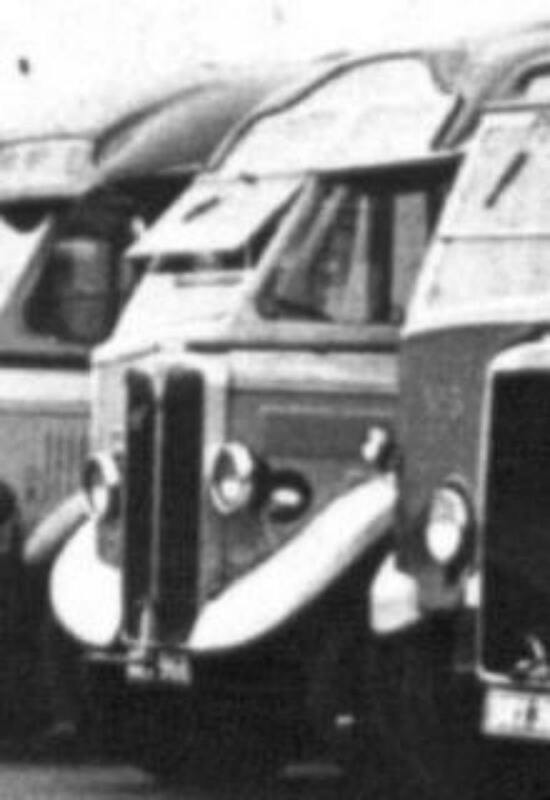 pits and a comprehensive stock of spares to the value of £2,000. 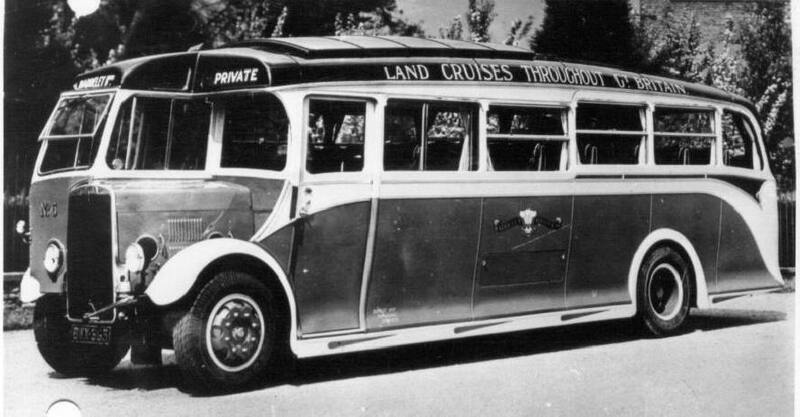 When a new vehicle is purchased, a book is started for it, in which every item of its “life” is recorded. 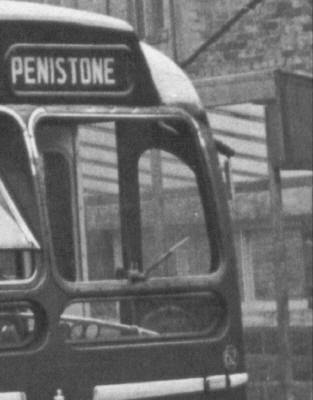 When the time comes for re-sale, this book is passed over to the next purchaser with the coach. 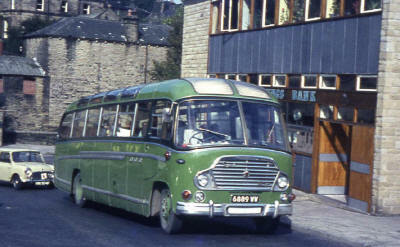 To obtain additional garage accommodation, Baddeley’s bought an old mill in Holmfirth in l946 and this also houses the paint shop and the body repair shop. 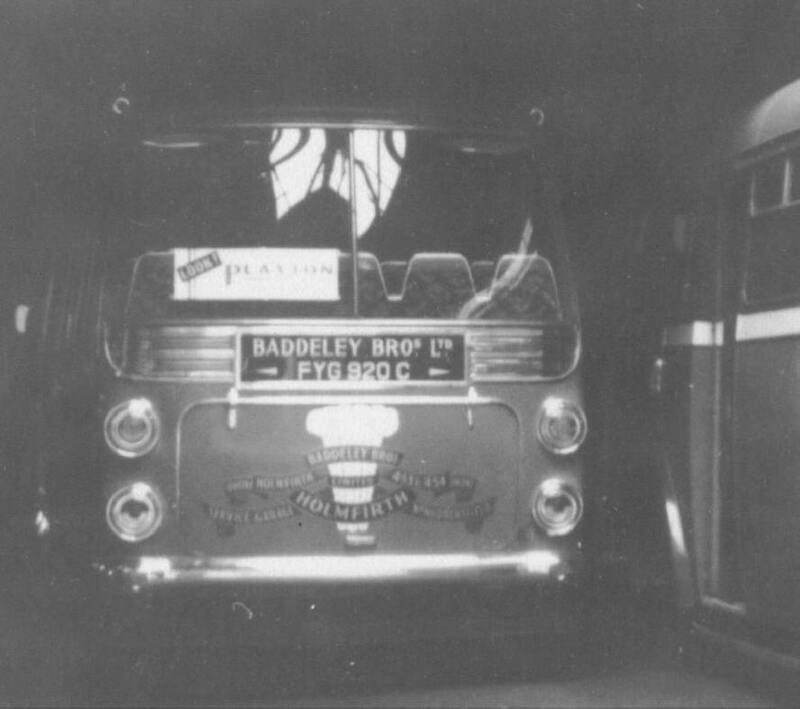 Baddeley's own main travel office at headquarters not only did an extensive business for its own operations but also acts as agent for Wallace Arnold Tours and Sheffield United Tours. Sheffield United has a feeder into Holmfirth itself, while Wallace Arnold operates a feeder from Huddersfield. 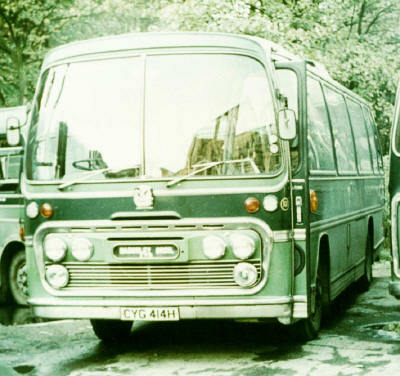 During the seventies several W.Y.P.T.E. 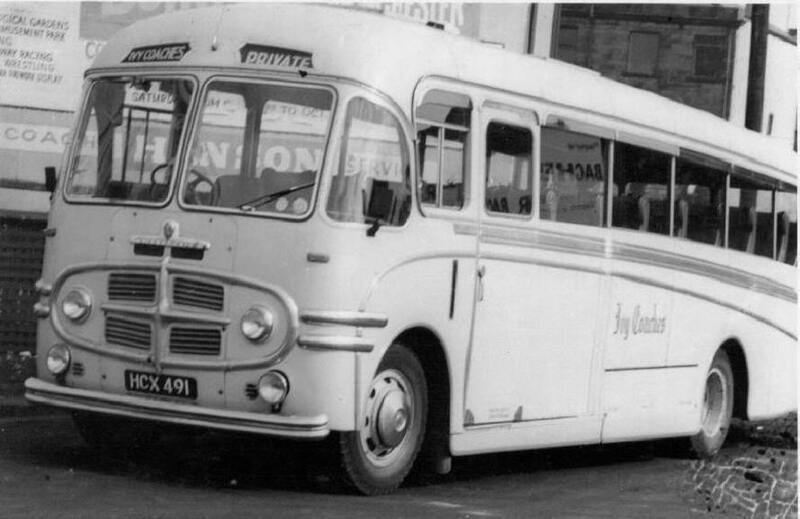 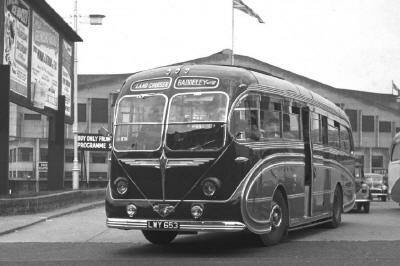 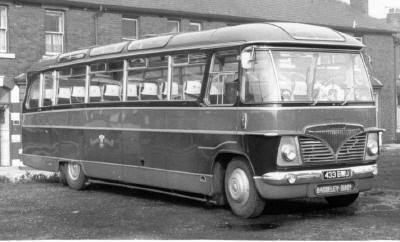 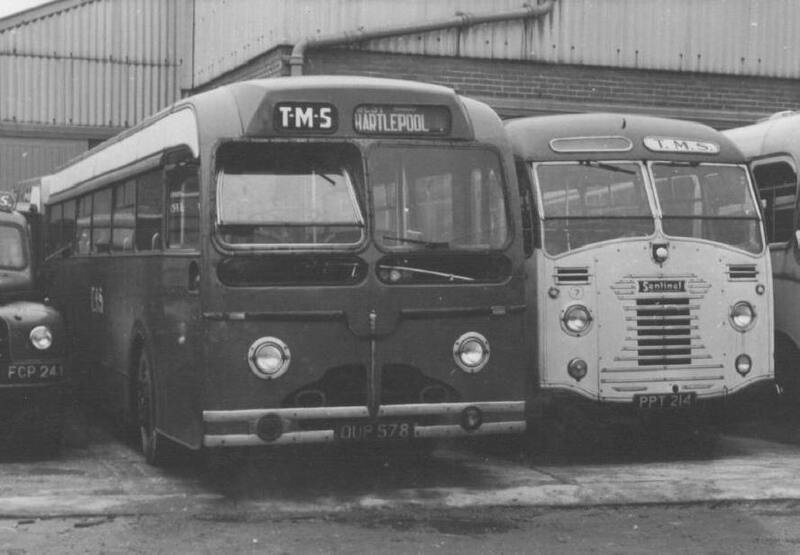 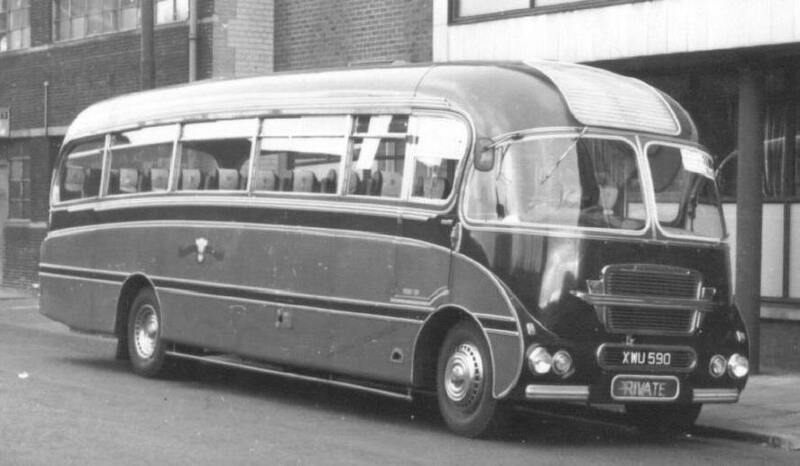 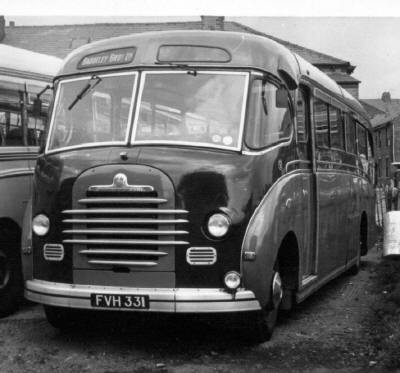 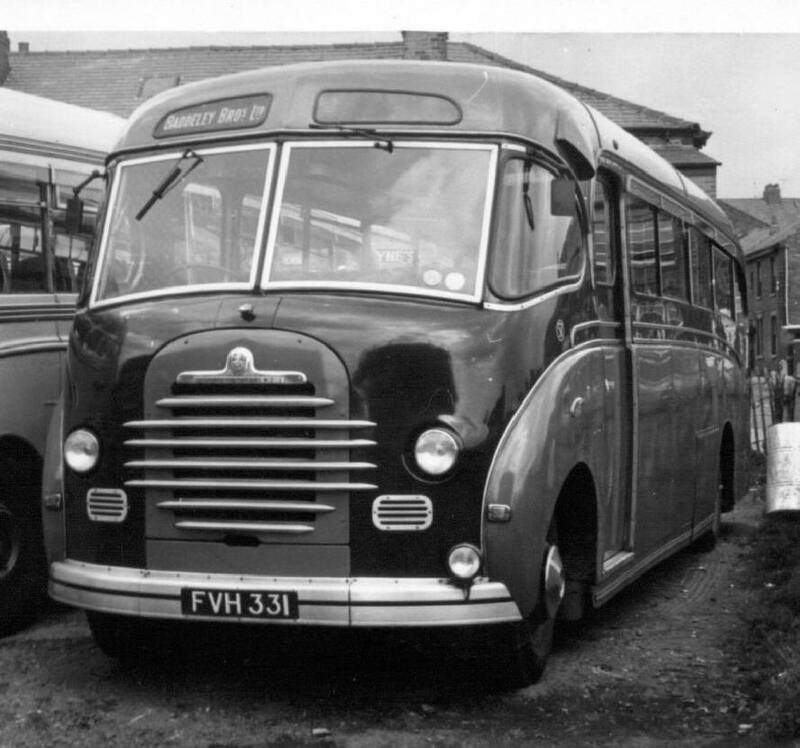 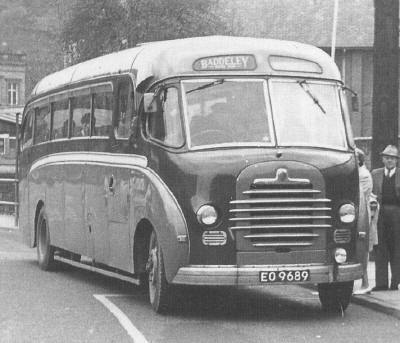 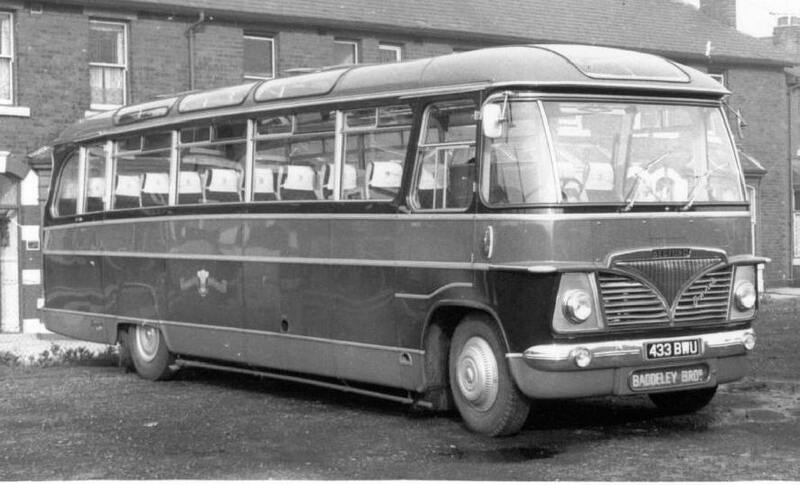 vehicles operated on loan to Baddeley's these included several former Huddersfield Corporation AEC Reliance's & Leyland Leopards, also former Halifax Corporation Seddon RU's which were now based at Huddersfield, & Bristol LH's from Leeds. 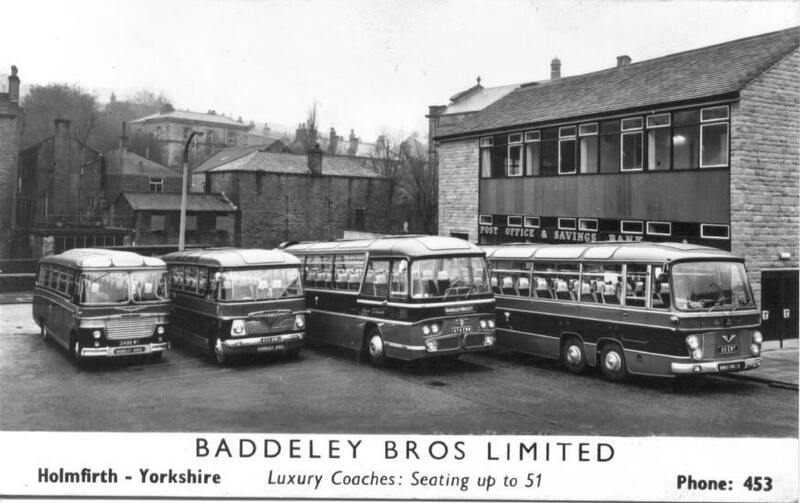 Baddeley's was sold to the West Yorkshire P.T.E. 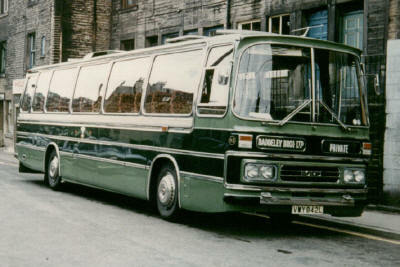 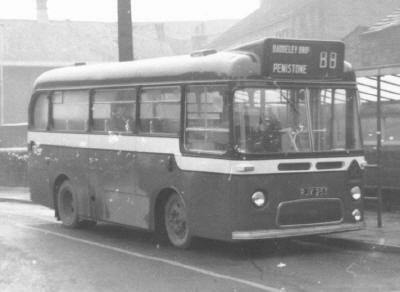 in 24 March 1976 and stage carriage services passed to the control of Kirklees District originally all journeys still operated from Baddeley's garage at Holmfirth except the 1710 Holmfirth-Penistone & return on Saturdays which was operated by one of the 8501 type leopards from Huddersfield garage, 9 July most of the service work was transferred to Huddersfield except for the two 6-00am Holmfirth-Penistone and the 4-50 Hepworth Iron Co-Penistone, these journeys were the last services still operated by Baddeley's, eventually these two am journeys were combined & replaced by a low height double decker from Todmorden operated by Kirklees District. 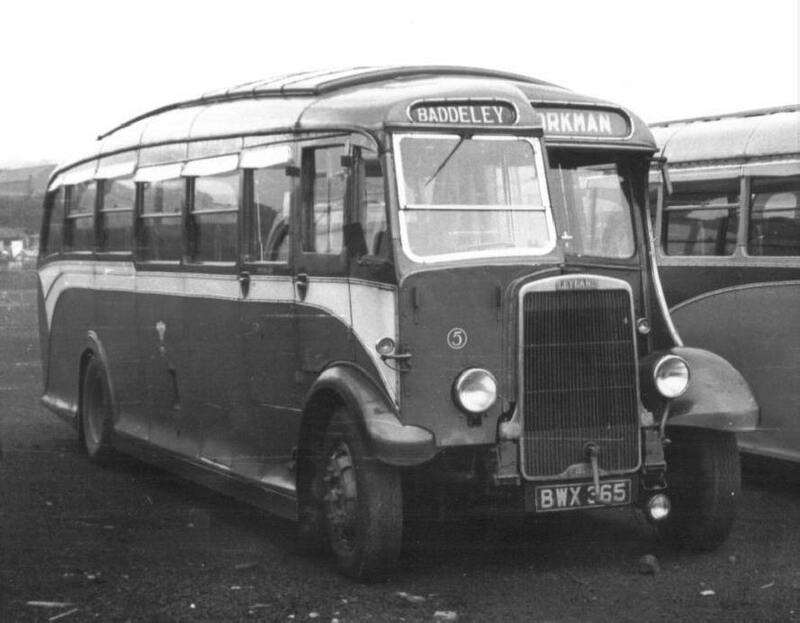 Baddeley's coaching was combined with Hansons, under W.Y.P.T.E. ownership, later sold to G.B. Hirst on 14 January 1980 soon with deregulated coach services a Barnsley-Manchester service was operated but did not fair much better than a previous Yorkshire Traction service which had previously been operated jointly with North Western. 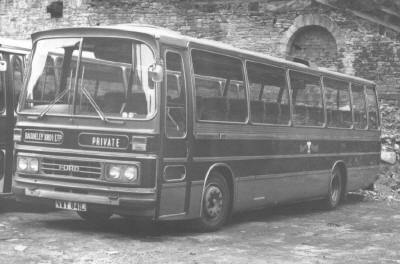 The company ceased trading when a receiver stopped the company from trading on 26 June 1981. 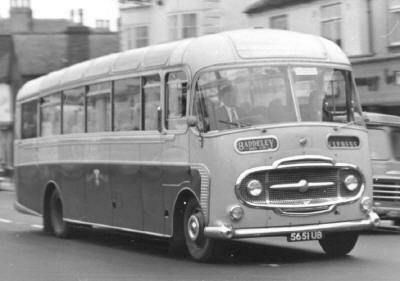 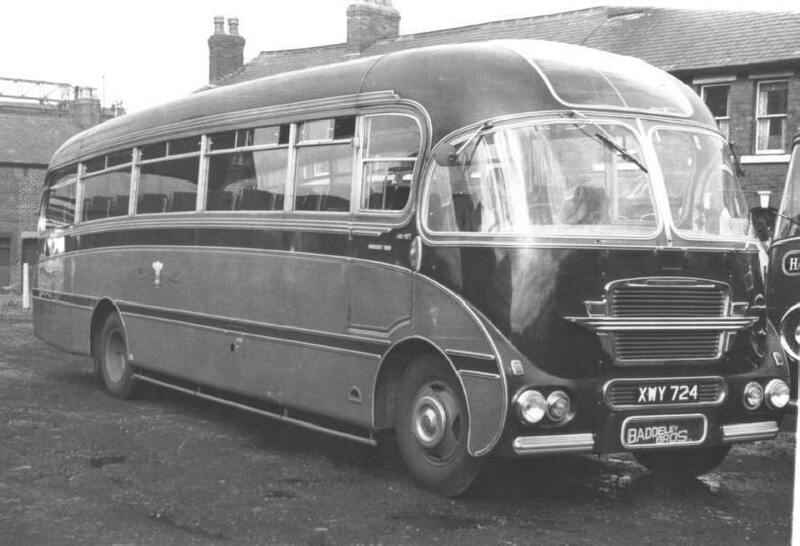 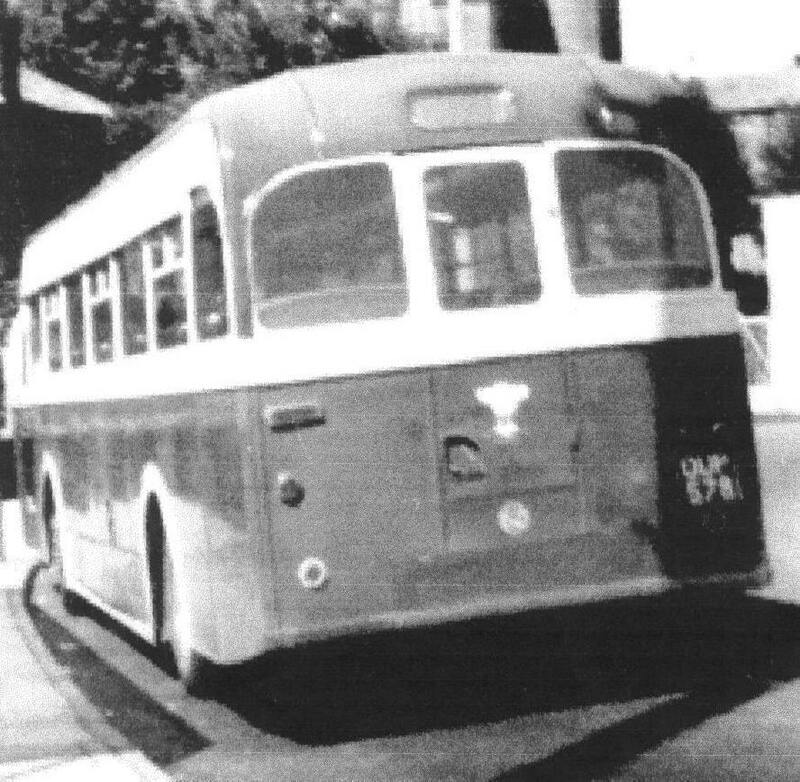 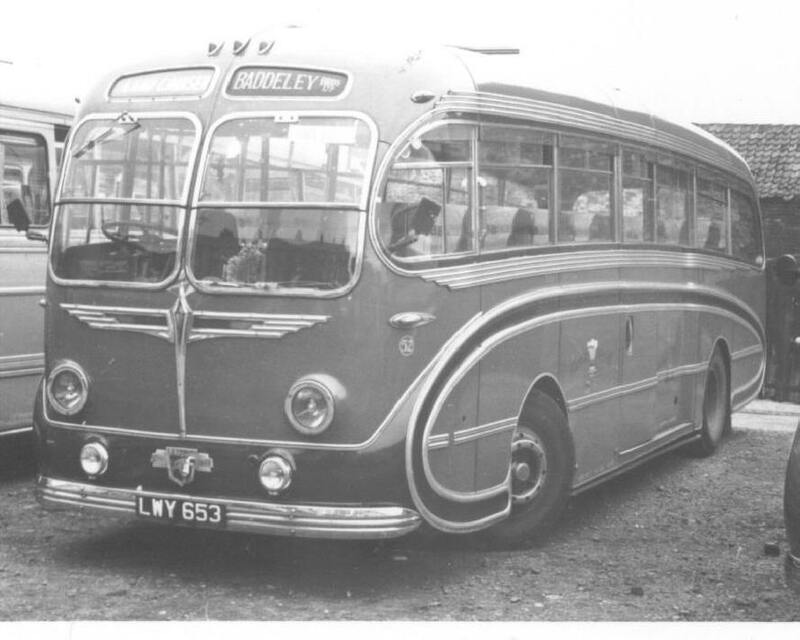 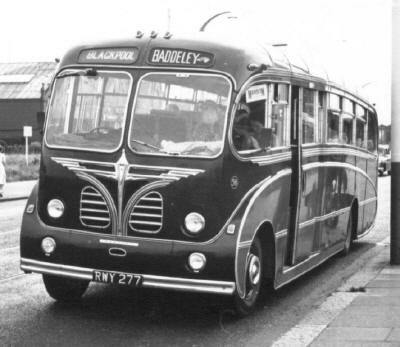 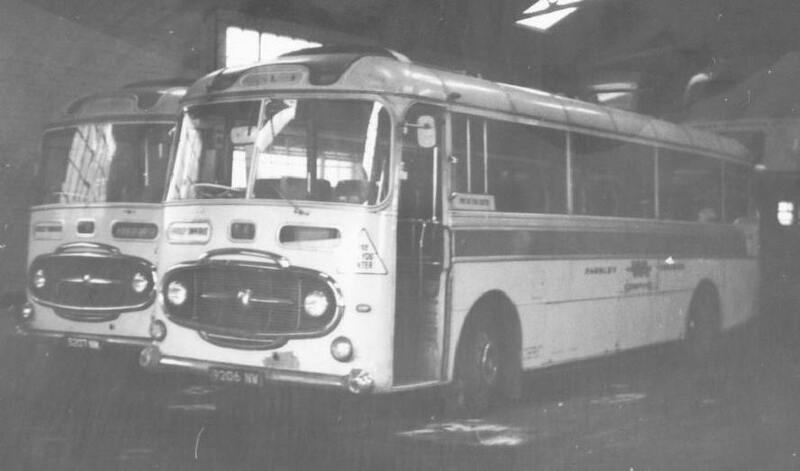 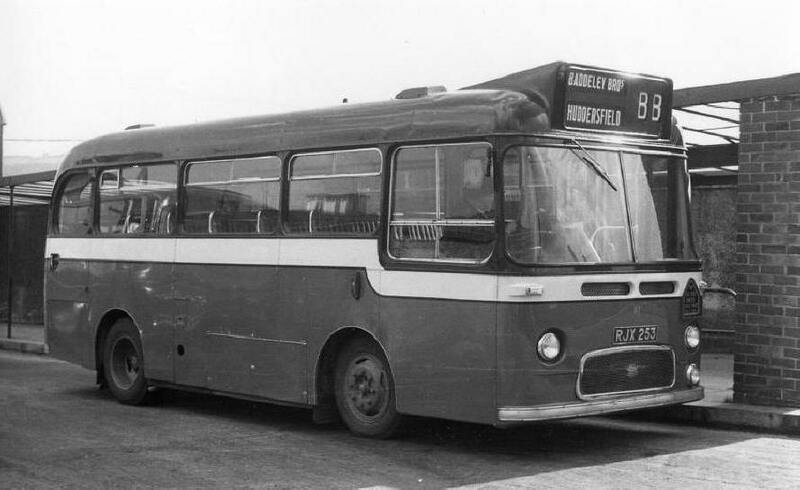 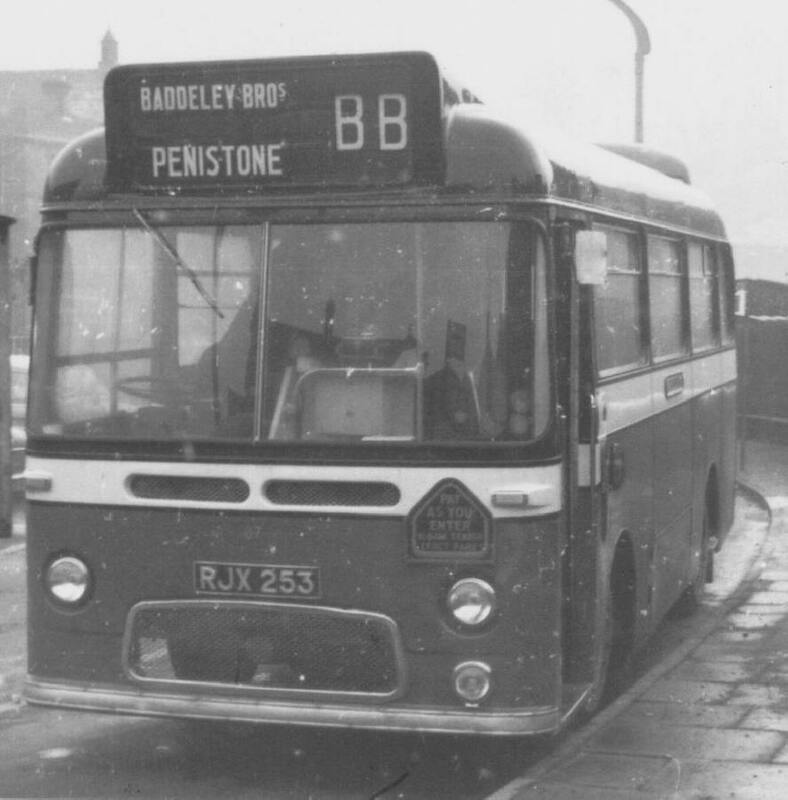 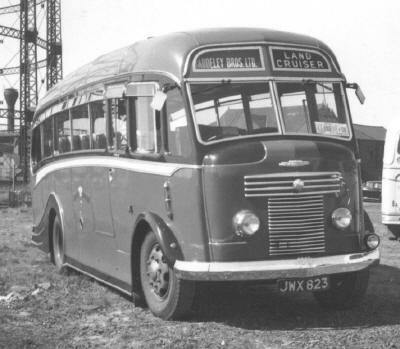 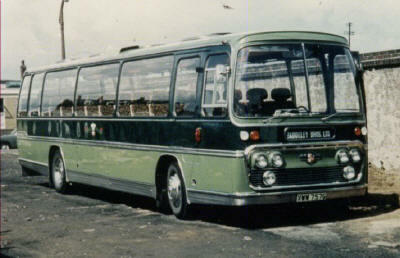 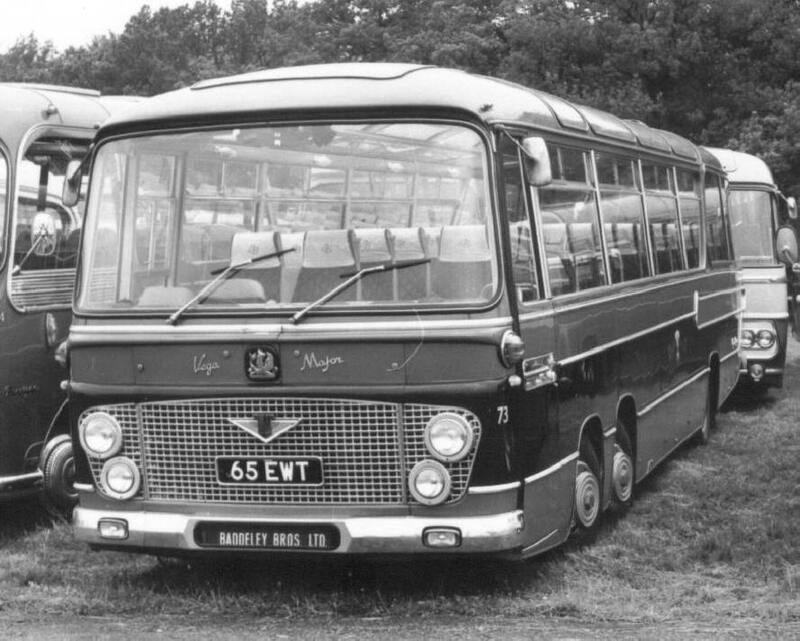 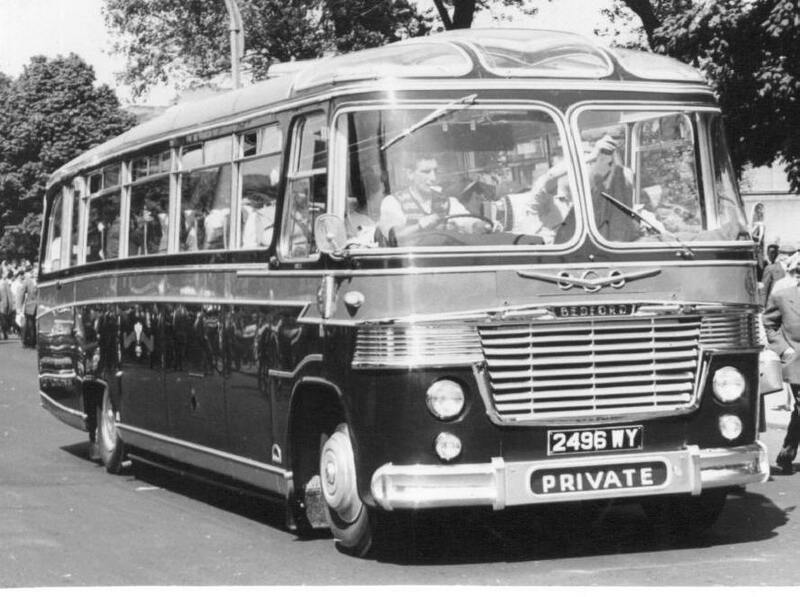 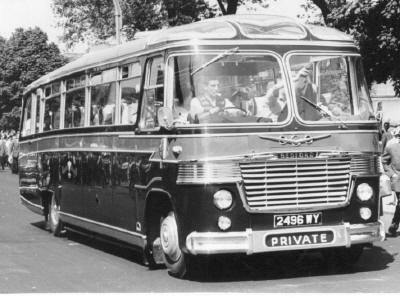 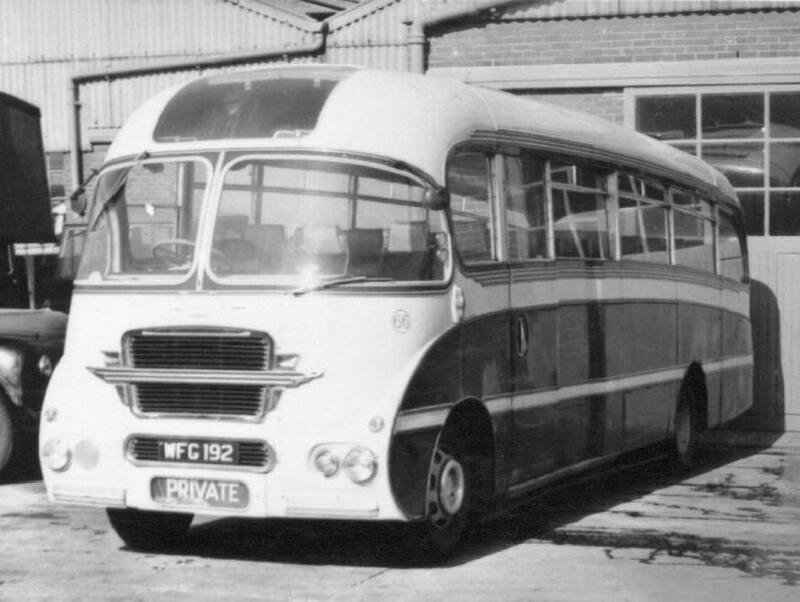 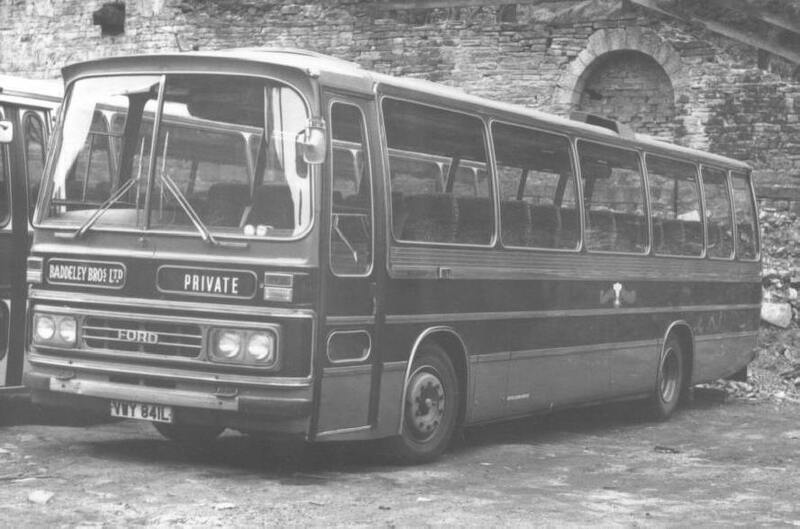 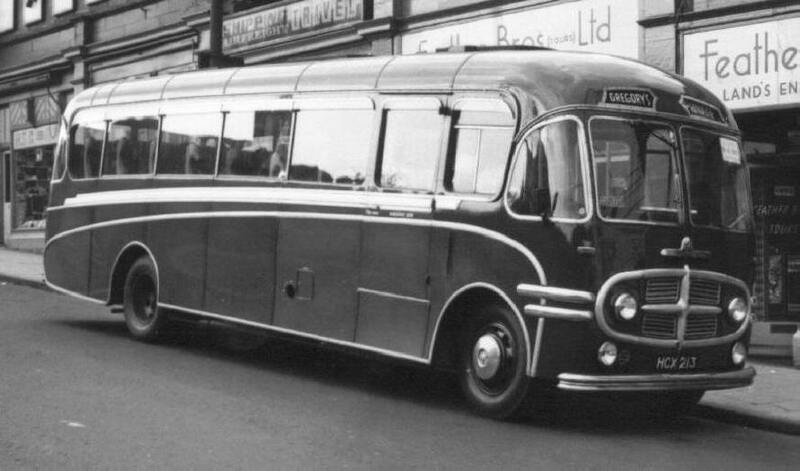 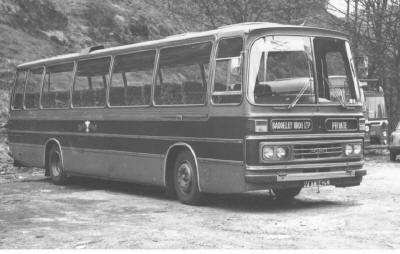 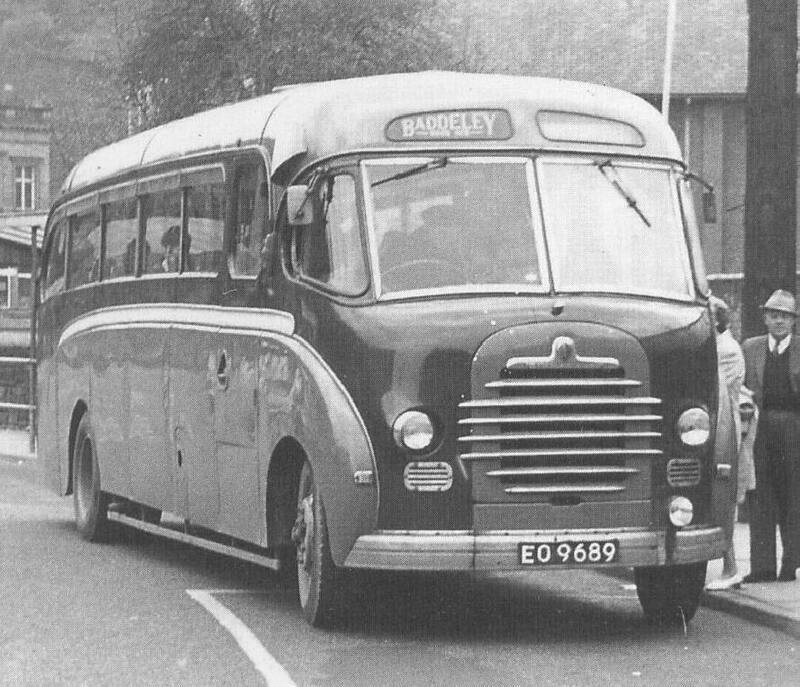 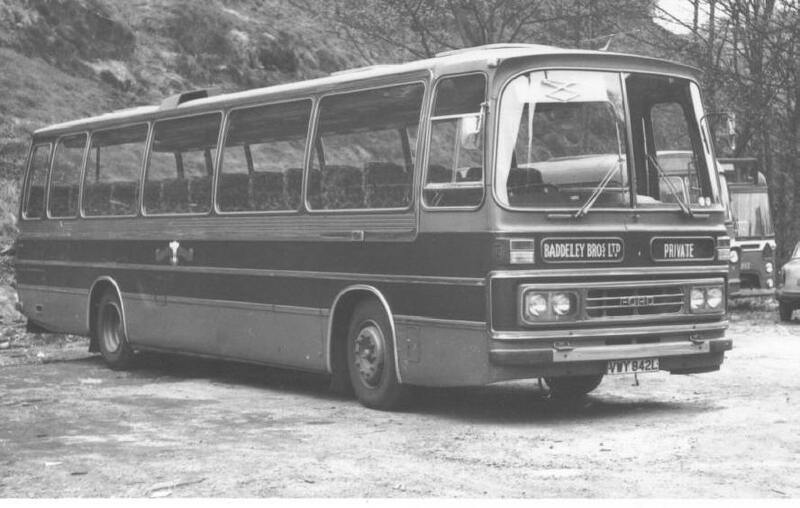 The Baddeley's livery has now been reserrected by the Huddersfield Bus Company from Waterloo Garage which was once County Motors, then Yorkshire Traction, then Stagecoach in West Yorkshire. on_loan__________________________ WW6130_ 1928 - ? 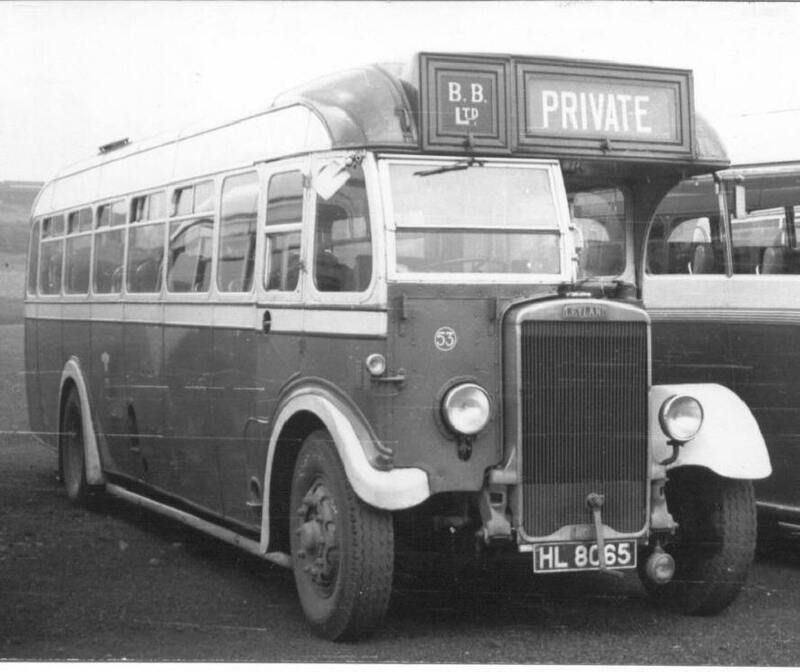 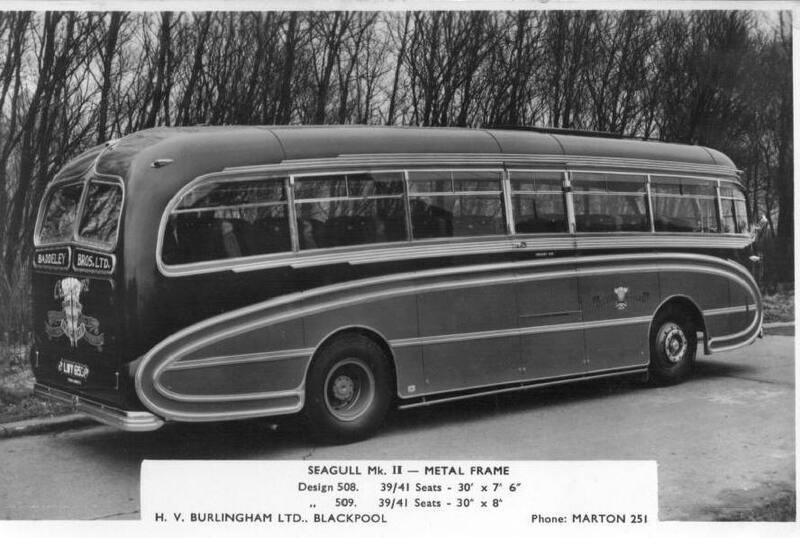 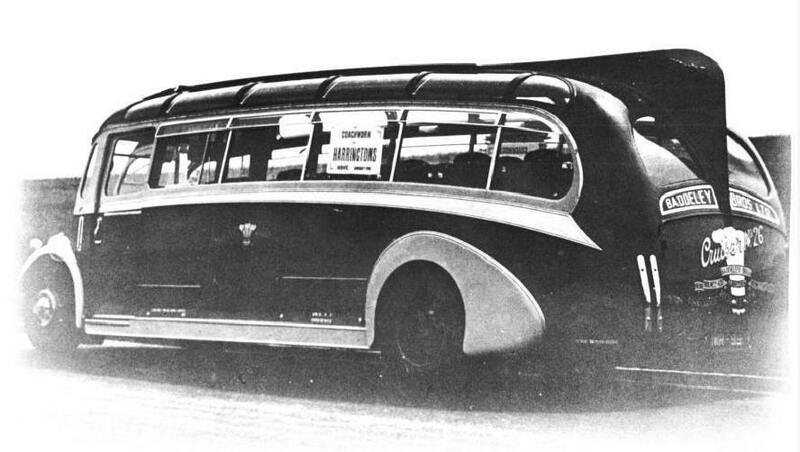 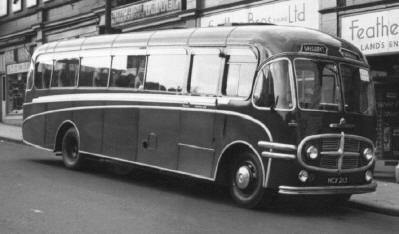 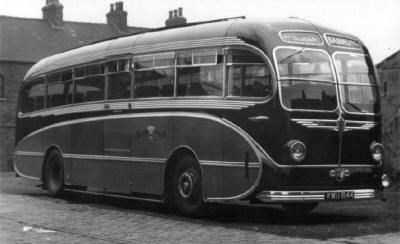 on_loan__________________________ HX585_ AEC Regal Weymann B30D seats 1930 - ? 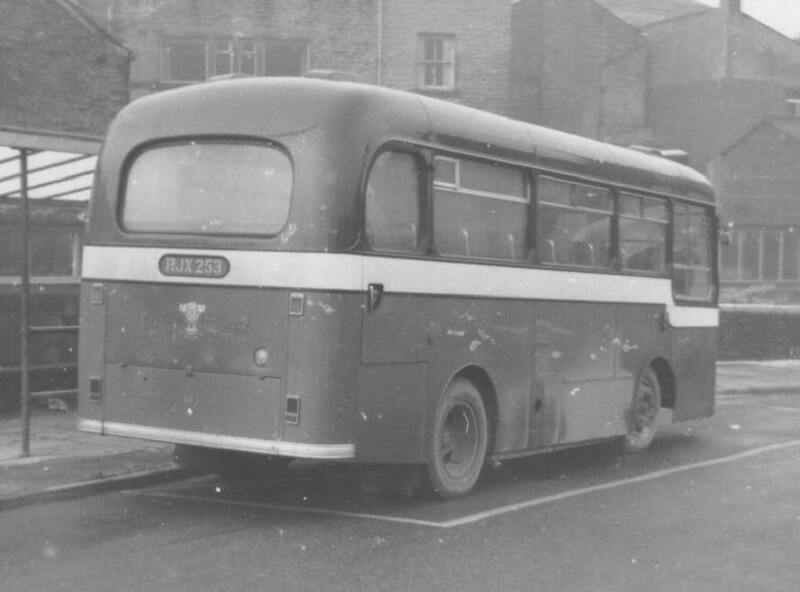 on_loan__________________________ GF9757_ Gilford B32? 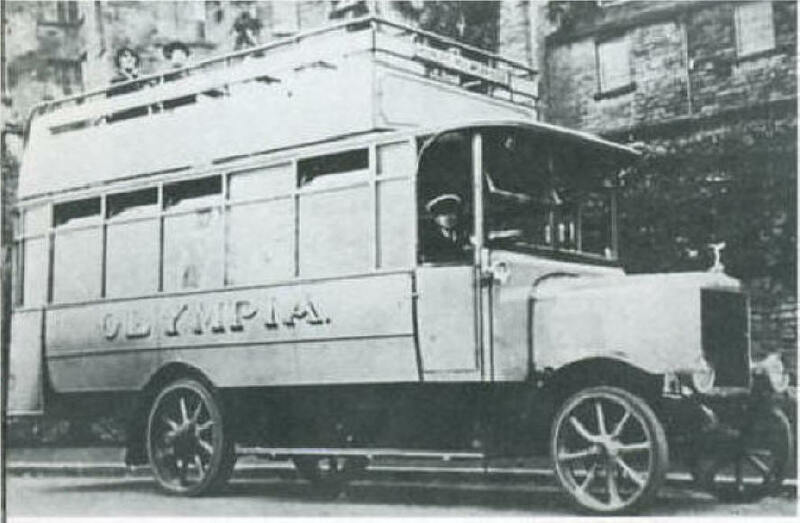 seats 1930 - ? 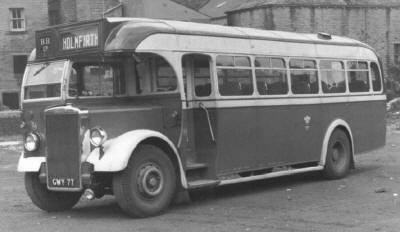 on_loan__________________________ TF995_ 1929 Leyland LT2 Leyland B35R seats 1930 - ? 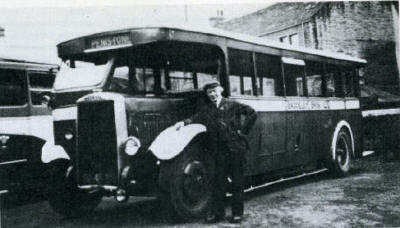 on_loan__________________________ MY2421_ 1929 AEC Regal Hall Lewis 1930 - ? 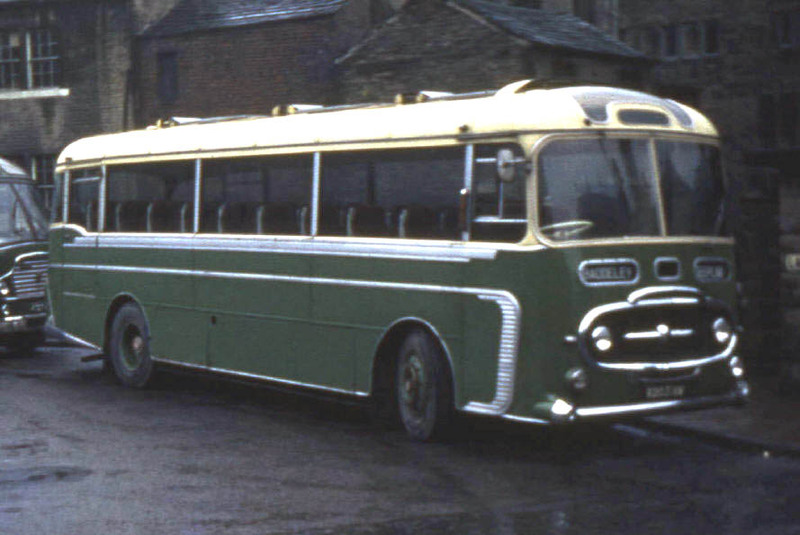 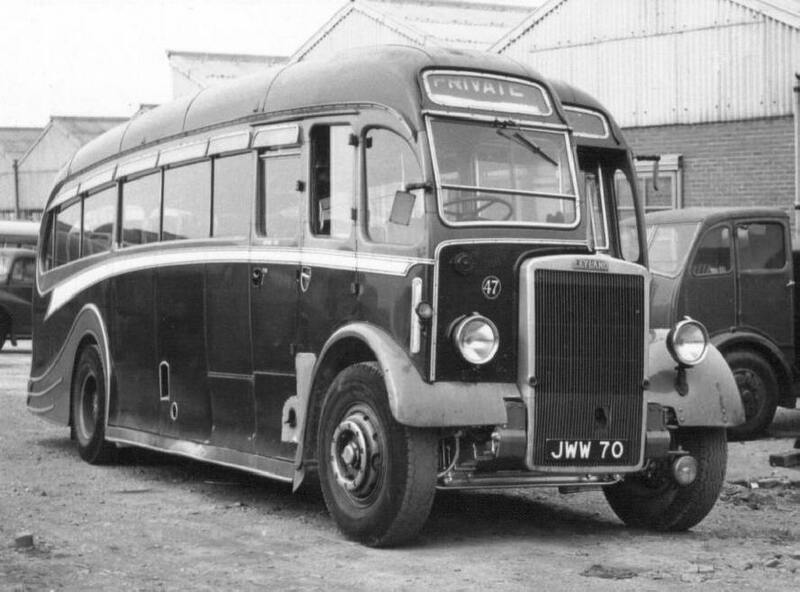 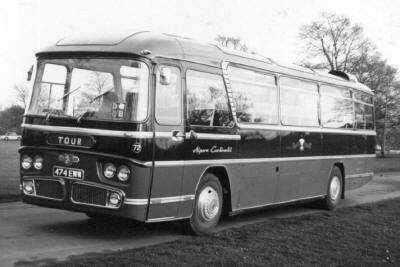 on_loan____ 96 CUM494C Bedford VAL14 Weymann C52F seats Jun - Nov 1968 ex Wallace Arnold.